173 Villas found. 1 - 173 Displaying. Villa Angel is an elegantly designed, luxurious private villa located a few kilometers outside the city of Chania in the area of Kalathas. This stunning property comprises of 7 bedrooms that can sleep 14 people, stylish living areas, a big private pool and huge garden with lawn, flowers, exotic plants and local trees. The residence is located a few minutes away from some of the best beaches in the area and is an ideal choice for families or large group of friends. 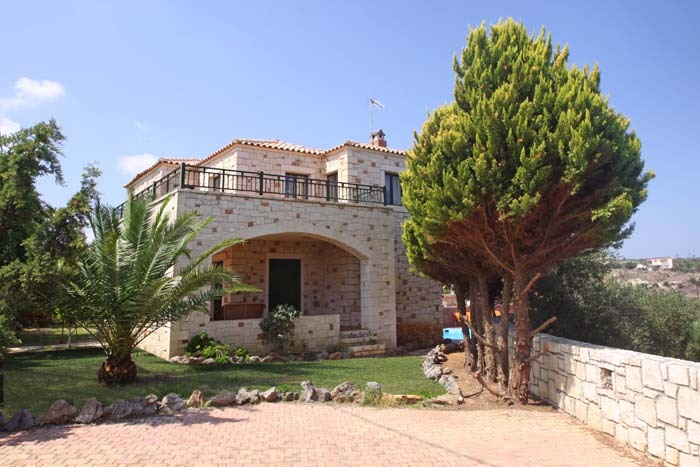 Villa Vrises is a 4 bedroom villa located near the village of Vrises, in the area of Chania. The house is surrounded by olive and orange trees, offers breathtaking views of the White Mountains and is a perfect retreat for those looking for comfort and relaxation in a peaceful and beautiful countryside. It consists of two spacious floors and an independent house on the ground floor and can comfortably accommodate up to 8 guests. 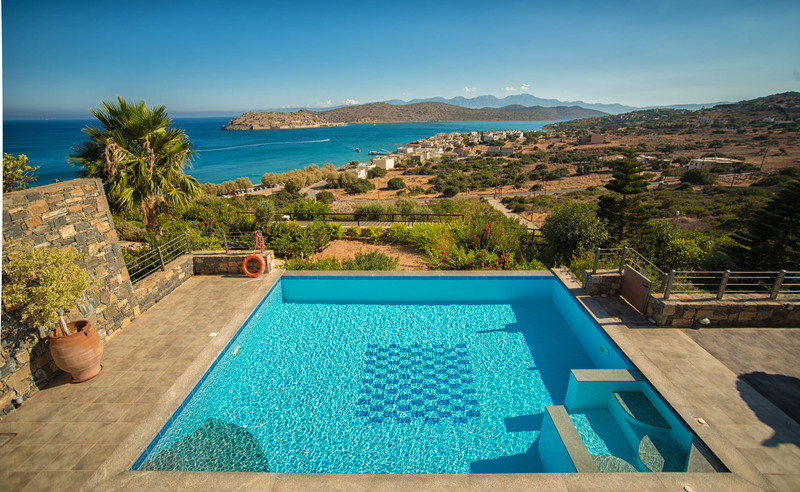 Villa Fortune is newly built residence located just a few minutes away from the worldwide known island of Spinalonga, the picturesque village of Plaka and a few kilometers away from the famous resort of Elounda. The villa is the definition of style and luxury, decorated with modern furniture and appliances and comprises of 6 en suite bedrooms that can accommodate up to 12 guests. The house takes full advantage of the amazing panoramic views of the sea and landscape offering privacy and tranquility that ensure a relaxing and unforgettable holiday! Villa Sea Breeze is a brand new 6 bedroom villa that sets very high standards of luxury. Located on a cliff between the two beautiful bays of Akrotiri peninsula in Chania, Marathi and Loutraki, Villa Sea Breeze offers an unbeatable view of the sea that cannot be compared with anything else. The villa can accommodate up to 14 guests in six luxury en suite bedrooms and is equipped with a range of modern appliances that combine functionality with comfort. 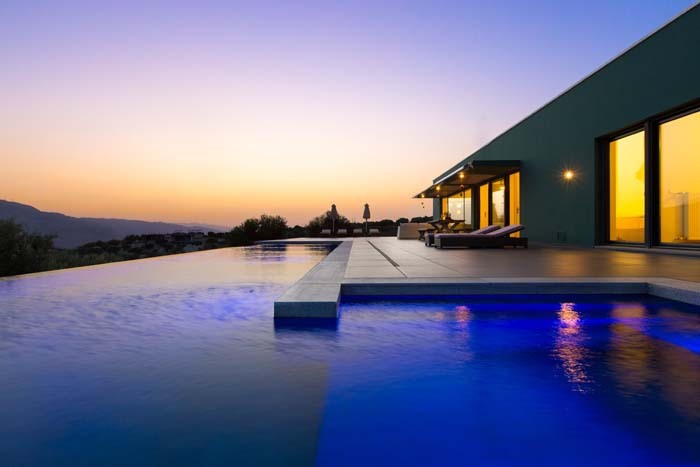 Infinity View villa is brand new chic and luxurious residence is situated on a privileged spot, on a hillside just outside the beautiful town of Agios Nikolaos, in Amoudara. It can accommodate up to 8 people in 4 bedrooms and offers a range of facilities, modern appliances and stylish interior areas to ensure a comfortable stay. Infinity View villa has a 200sqm outdoor area, with a well-kept lawn garden, big swimming pool, BBQ area, a unique holiday for its guests. 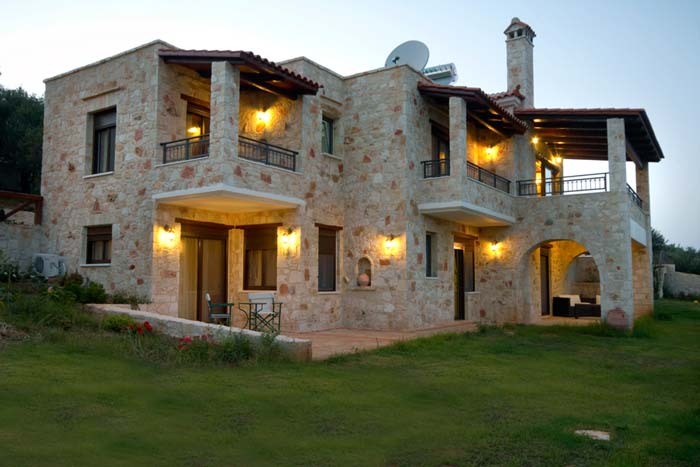 Villa Apollon is a beautiful, stone built villa located on a hillside above the famous resort of Hersonissos. 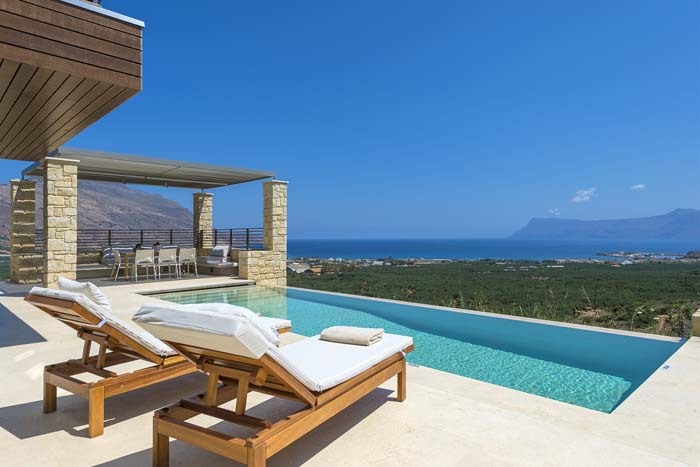 This 3 bedroom villa with its breathtaking views, its large private pool and spacious, elegant interior areas is an ideal choice for a luxury vacation in the magnificent island of Crete. Villa Odyssia is a stylish, spacious villa built on 3 levels, with a 50sqm private pool, luscious gardens and beautiful views of both mountain and sea. It boasts 5 bedrooms, 3 bathrooms, 2 fully equipped, modern kitchens, large entertainment areas, a feature fireplace and a classic piano. The surrounding landscaping is ideal for outside dining with 2 BBQ areas and a pizza oven. It is also only a 5 minutes’ walk away from the finest sandy beach of Almyros and a 5 min drive to the center of town. Villa Galini is a cozy villa that belongs in a complex located near the cosmopolitan town of Hersonissos. Although next to the lively town this cosy villa stands in a quiet and peaceful area ensuring relaxation and comfort to its guests. 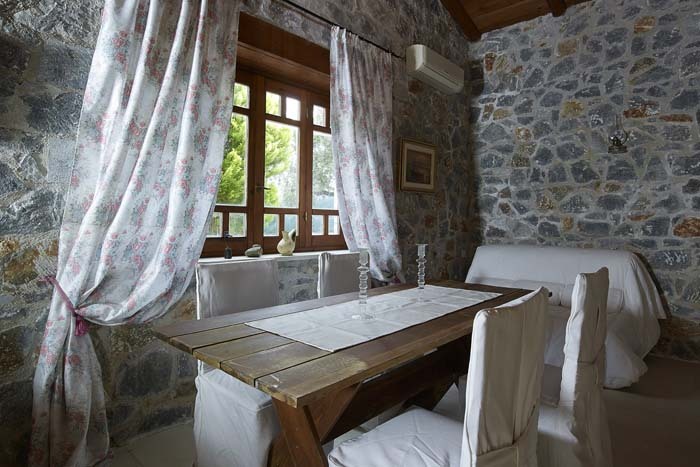 Villa Galini can accommodate up to 8 guests in 3 bedrooms and has a charming traditional feel with its stone walls and wooden shutters. The house offers a range of modern facilities and spacious indoor and outdoor areas. 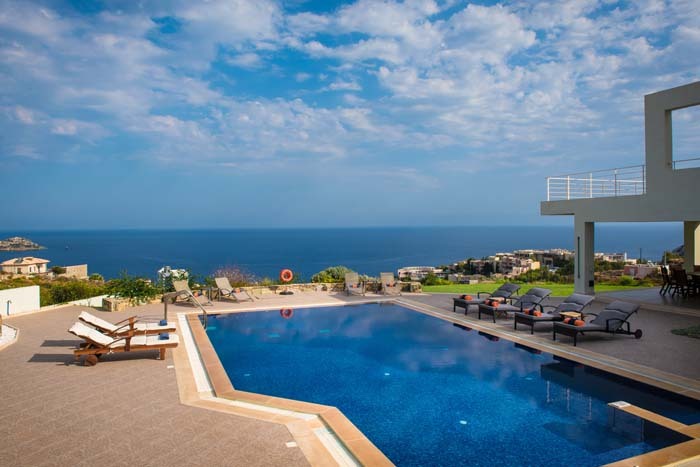 Epavli Villa is a luxury 6 bedroom villa, located just 25 minutes from Heraklion with ultra modern amenities, infinity pool, breathtaking views and a private bath to the beach. This 2 level villa can accommodate 12 guests ideal for families with its interior designed on a modern and minimal base. The property has ample space for total relaxation with your eyes traveling beyond the horizon and your senses to be awaken and enjoy the perfect paradise for your holidays. Blue Island Villa is a beachfront, luxurious three bedroom villa located in the area of Elounda, 15km away from the town of Agios Nikolaos and a few minutes’ drive from the cosmopolitan resort of Elounda. The villa is built just a few meters away from the sea with only its lawn garden separating it from it. 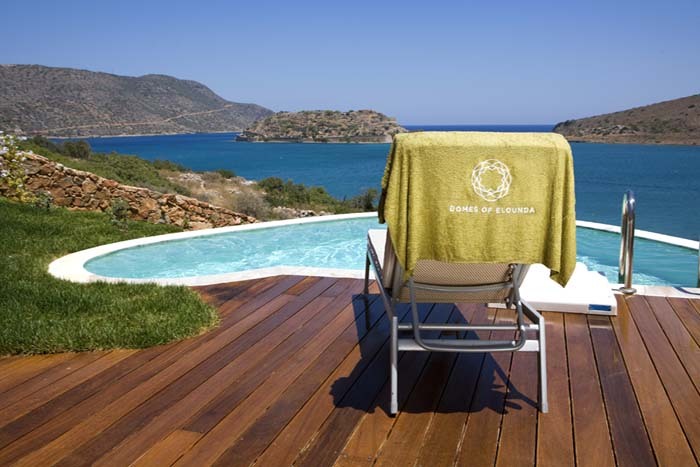 It has a private swimming pool and verandas with beautiful views of the Mirabello Gulf and the island of Spinalonga. It consists of 3 bedrooms and two luxurious bathrooms, a fully fitted kitchen as well as a spacious living room and dining area. Blue Island Villa is an ideal choice for a luxurious holiday in an environment that looks like heaven on earth. 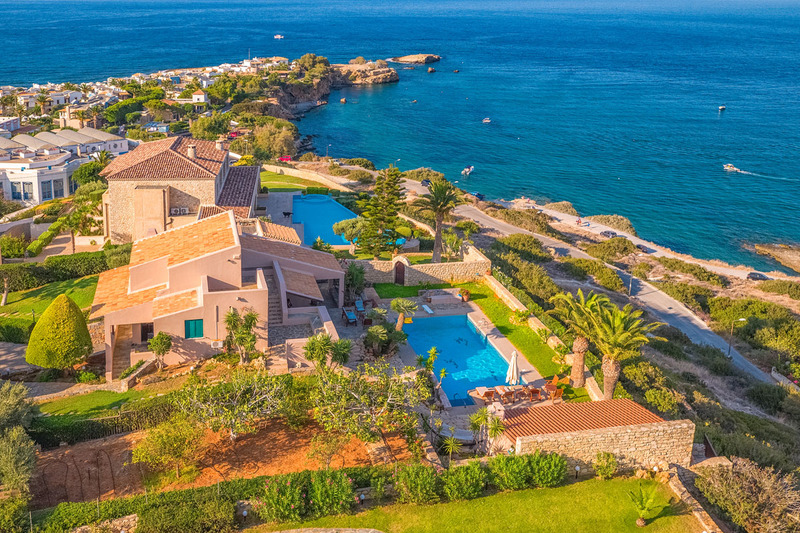 Villa Petra 4 belongs in a complex of four independent villas located in the area of Kato Gouves, on the north coast of Crete. The villa combines the characteristics of the traditional Cretan architecture with those of modern design which creates a marvelous and luxurious holiday home. The villa has 1 master bedroom and a loft with a double bed and comfortably accommodates 4 guests. It has a private swimming pool, garden and furnished terraces. 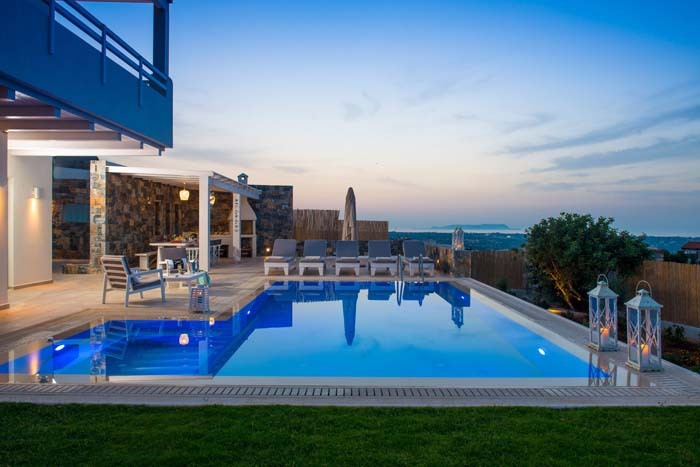 Villa Alivia is a brand new, modern and luxurious villa located in the village of Kontomari in the area of Platanias, Chania. The villa belongs in a complex of three residences but offers absolute privacy and promises comfort and relaxation to its guests. The villa has 3 stylish bedrooms, two bathrooms, a private swimming pool, high quality furnishing and stylishly designed interior and exterior areas that will meet the expectations of even the most demanding customer. Villa Alivia is a perfect choice who are seeking a hideaway retreat with chic luxury, privacy and mesmerizing beauty. Villa GG is a modern villa, built in 2016 and located just above the village of Kokkini Hani in Heraklion an ideal choice for all seasons. 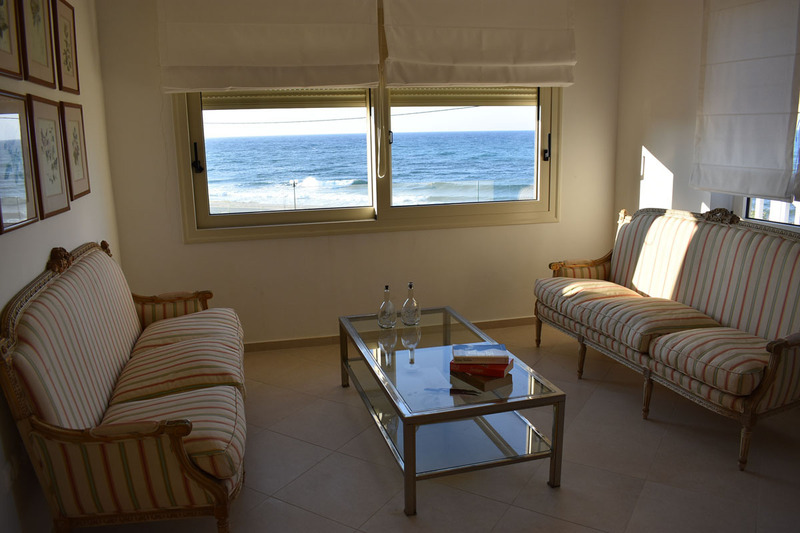 The villa provides modern facilities and amazing sea views. 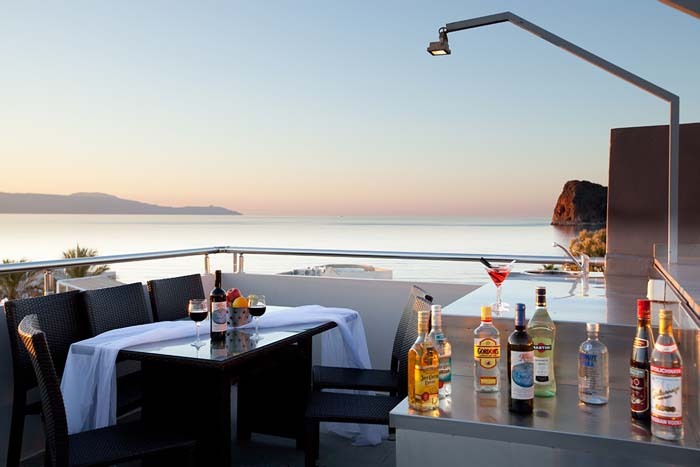 Guests can take advantage of the moments of relaxation with impressive view from sunrise to sunset. It can accommodate up to 10 people in 4 bedrooms and offers a range of facilities, modern appliances and stylish interior areas to ensure a comfortable stay. Villa GG has a huge outdoor area, with a well-kept lawn garden, 50 sqm heated swimming pool, BBQ area and a sauna that guarantee a unique holiday for its guests. 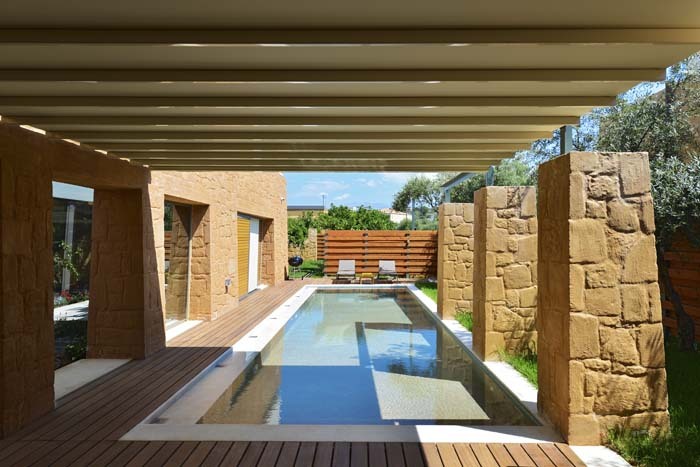 The villa was built from the owners in a minimal architectural design with passion and love. 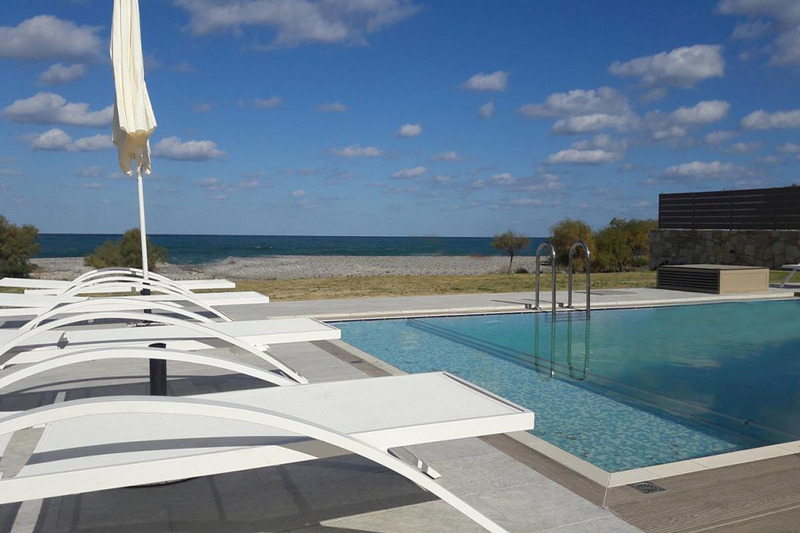 Villa Makrigialos is an beautiful beachfront villa located in the area of Makrigialos in South Crete. The villa stands only a few meters away from the sea and actually has access to a private, rocky beach with an amazing natural cave offering its guests a private "piece of heaven on earth"! The villa has 4 bedrooms, spacious and beautifully decorated living areas and is equipped with all modern facilities. Built on a 1450sqm plot of land the villa has a big private pool with salt water, several furnished terraces and a garden with exotic trees all with amazing views to the Libyan sea. Nearby there are some of the most amazing beaches in Crete and the tranquil village of Makrigialos with numerous restaurants, bars, cafeterias and shops. 10% Discount fro all bookings for staying between 01.04 & 31.10. 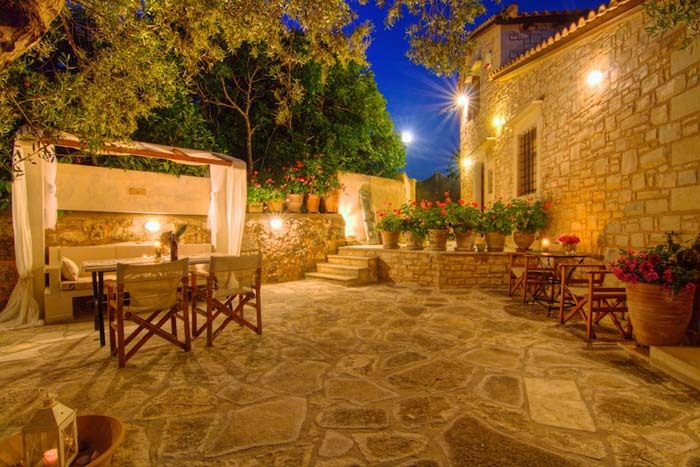 Villa Plaka is a stylish, cosy villa located on a hillside in the area of Plaka- Chania. The property is built only 150m away from the sea and offers magical, panoramic views of the endless blue and the mountains. It consists of three bedrooms, two bathrooms, a fully fitted kitchen, beautifully decorated living areas and a mini gym/ game room. Outside there is a private pool, BBQ and beautiful garden. Carme Villas is a complex of twelve cosy villas built in six two-storey separate buildings, located in the village of Adele. Adele is only a ten minute drive from the city of Rethymno and 800m away from the sea. Each villa lies on two floors and has an interior area of 80sqm. They consist of two bedrooms, kitchen, living/ dining area and two bathrooms. 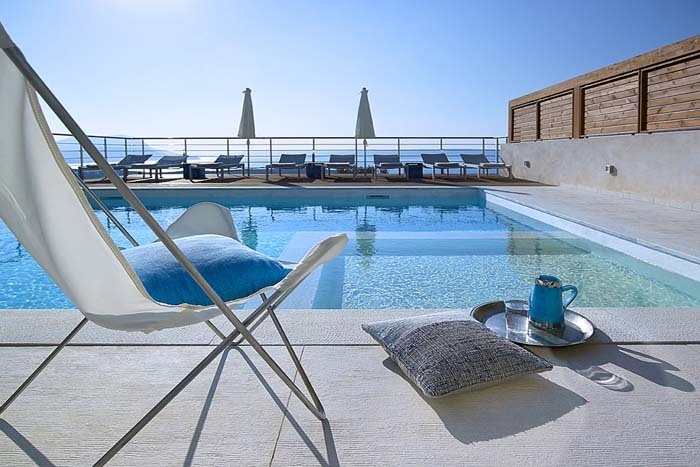 Each one features a private pool, terrace with outdoor furniture and is fully equipped to serve your needs. Villa Alpha is located in the area of Almyrida in the prefecture of Chania. The house consists of two independent apartments connected by an external staircase, making it an ideal choice for families or friends. There are three bedrooms in total, accommodating 6 guests, while two extra beds are available if requested. The villa has a private pool, garden and balconies. A beautiful beach, shops and restaurants are only 100 meters away! Villa Theano is a luxury 4 bedroom villa, located on the outskirts of the cosmopolitan town of Agios Nikolaos. This impressive villa stands in its own grounds offering panoramic views of the town of Agios Nikolas and the Mirabello Bay. Once inside you will be impressed by the spacious open plan, living area which gives a light airy feel to the villa. Theano has a 65sqm private swimming pool with a mosaic design in it and a spacious BBQ area under a pergola, where you can enjoy your holiday evenings. 30% Discount for staying between 26.05 - 30.06. Special offer 400,00 euro per night for staying between 01.07 - 13.07 for a minimum stay of 7 nights. 15% Discount for all bookings. Villa Eleni is a luxurious villa with a unique architectural desingn, situated on a hill overlooking the bay of Kissamos near the city of Chania. The villa has a modern and stylish decor which will impress even the most demanding guest. It can accommodate 4 guests in its two bedrooms and has luxurious bathrooms, a fully equipped kitchen and a living area with all the modern appliances. The villa offers a private pool, modernly furnished terraces and balconies all with magnificent views of the sea and mountains. Villa Athena is a brand new villa located in a quiet and peaceful spot overlooking the sea and the tourist resort of Hersonissos. The villa offers a range of high quality facilities and has 3 beautifully decorated bedrooms that can comfortably accommodate 6 guests. 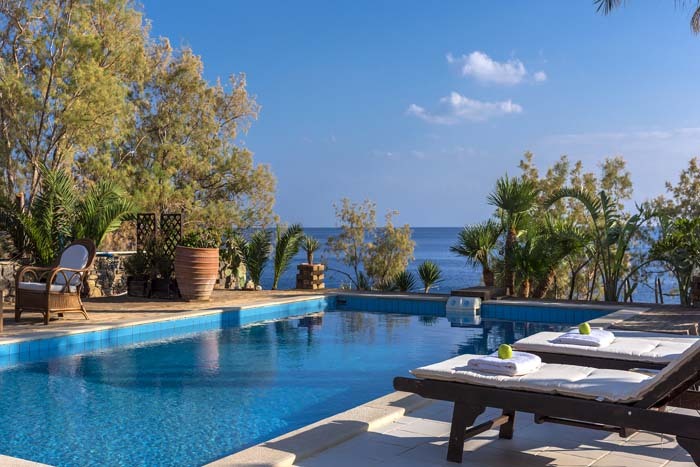 With a big private pool, beautiful garden and stunning views, Villa Athena is a perfect choice and ensures an unforgettable holiday in Crete. Pleiades Villas is a complex of 9 individually designed villas, all with private swimming pools, overlooking the Mirabello gulf. 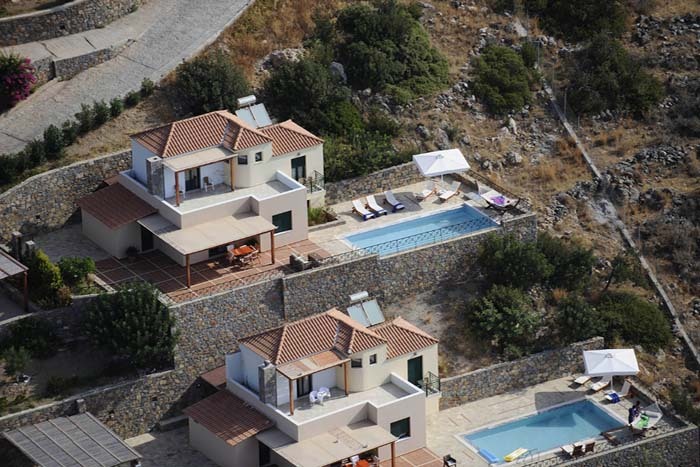 The complex hangs over a hillside between Elounda and Agios Nikolaos and overlooks the Mirabello Gulf. The villas have two or three bedrooms and are decorated in style with high standard furnishing ensuring their guests an unforgettable accommodation. 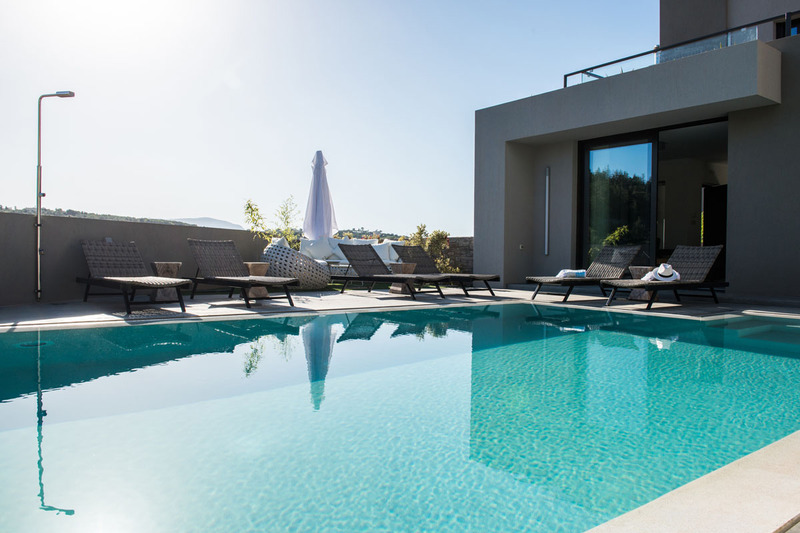 Pleiades Villas are spacious, contemporary, luxurious and combine the advantages of an independent villa holiday with those of a hotel-style service. Awarded by Conde Nast Johansens as well as World Luxury Hotels in 2007, Pleiades Villas are suitable for couples, groups or families. 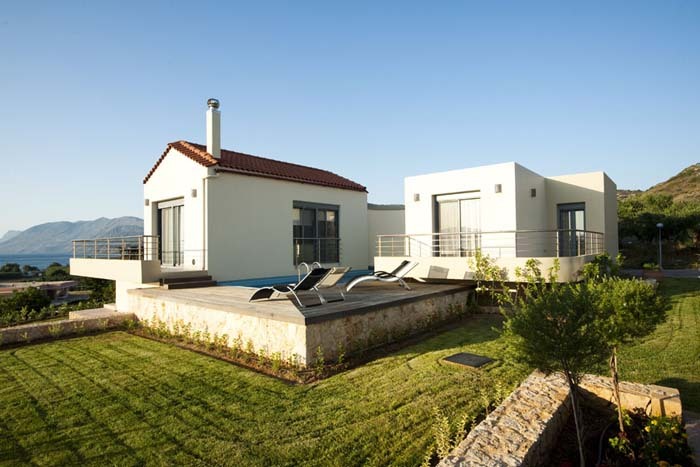 Villa Apoi is a brand new villa situated in the area of Apokoronas- Chania. It belongs in a villa complex and consists of three levels. The villa has 4 bedrooms all en suite with luxurious bathrooms and with their own terrace, a private pool / children’s pool and an outdoor Jacuzzi tub on the top floor of the villa. Villa Apoi is built on the highest spot of the plot, enjoying panoramic views ranging from the blue strip of Souda Bay, the scattered Apokoronas villages to the magnificent White Mountains. 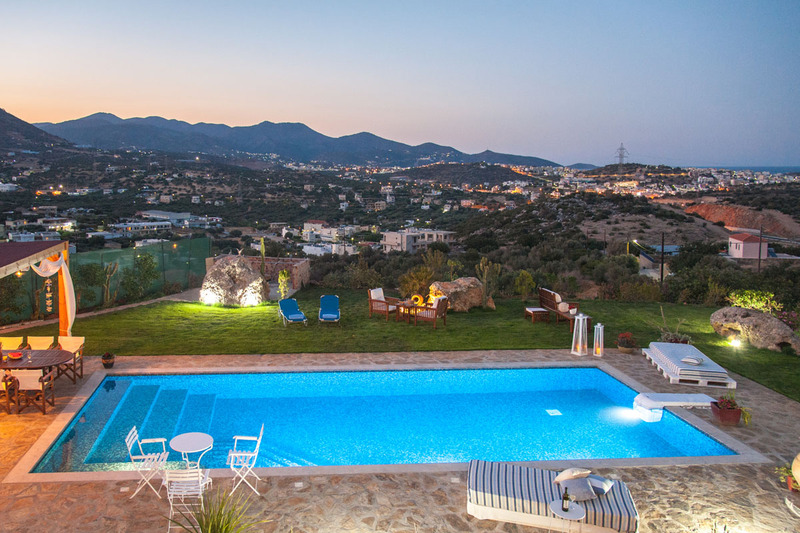 Villa Mouses belongs in a small complex of three independent luxury villas, the Cretan Dream Villas, and is located between the towns of Agios Nikolaos and Sitia. The villa lies on one of the most amazing landscapes offering beautiful views of the surroundings, while it stands on a hillside. It offers panoramic views of the village of Mochlos, the sparkling waters of the Mirabello Gulf and the islet of Mochlos with its Minoan ruins. 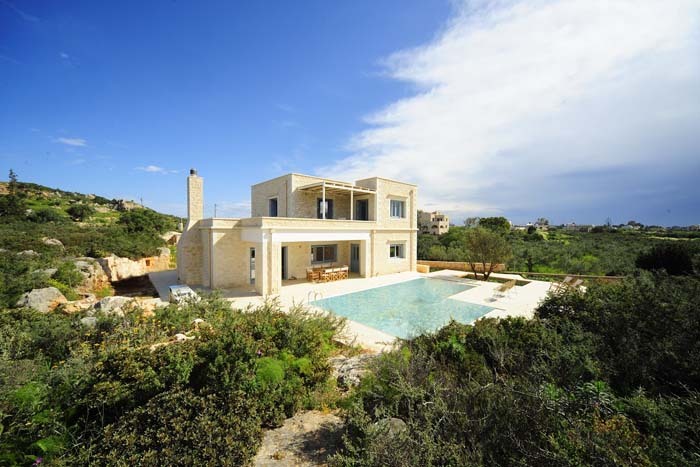 Villa Mouses is independent and ensures privacy. It has two bedrooms, its own swimming pool, verandas, patios, greenery and parking space. The family hospitality, architecture of the villa, quality of service and peaceful environment make this villa and ideal choice for a relaxing holiday. Villa Symphony is a brand new villa that belongs in a villa complex, the Euphoria Villas. The villas are situated in a privileged spot in Western Crete, the village of Agios Georgios near the small town of Kissamos. These private villas are designed to provide a luxury holiday to their guests and emphasise on the indoor modern decoration but also on the outdoor relaxing area. The complex stands on a hillside overlooking the Gramvousa Peninsula and the sparkling turquoise waters of Kissamos Bay. Villa Symphony has two bedrooms, a private pool and terrace while it is fully equipped to serve the needs of its visitors. Villa Venus is a modern, contemporary villa situated amongst orange groves in the area of Platanias, near the town of Chania. The villa has three bedrooms, a 50sqm private pool, a garden and is equipped with a range of facilities, while its quiet location is perfect for those that are looking for serenity and privacy during their vacation. The property is close to a typical, traditional Cretan village and a few minutes’ drive away from the busy resort of Platanias with its long beaches, shops, restaurants and nightlife. 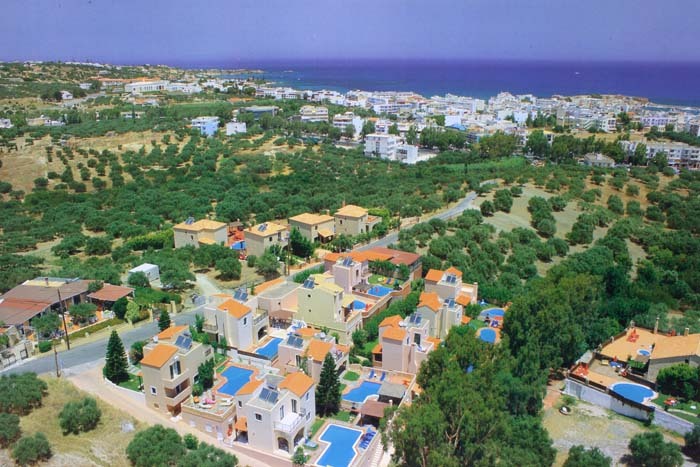 Located in an idyllic location in the area of Agia Marina, Chania are the beautiful Pasiphae Villas. 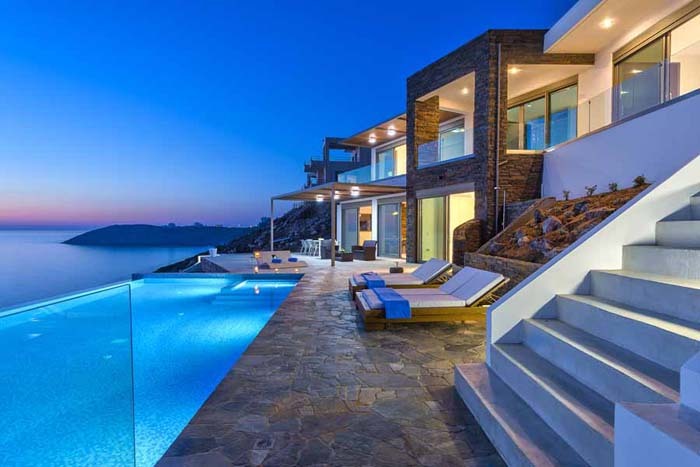 The complex consists of 6 identical, four-bedroom villas offering panoramic views of the turquoise waters of the Aegean Sea and the island of Thodorou. Each villa is equipped with a range of modern amenities and has its own private pool and spacious terraces. The villas are set within walking distance of the sandy beach of Agia Marina and are a perfect choice for families, couples or groups of friends. Seven traditional, stone built villas, situated in the cosmopolitan tourist resort of Platanias, close to the picturesque town of Chania, form the Platanias Villa complex. Each villa has two, three or four bedrooms, a garden and terraces while their are fully equipped with all modern facilities to provide a comfortable and luxury accommodation to its guests. Special feature of these villas is their swimming pools which in some are semi- indoor, semi- outdoor creating a unique and romantic atmosphere! The villas stand only 700m away from the center of Platanias, with numerous restaurants, shops and night life and really close to a blue flag, beautiful sandy beach. 10% Early Booking Discount for stays during the period: from 1/4/2018 until 31/10/2018, applicable for all bookings made up to 31/3/2018. Villa Alkestis belongs in a small complex of three independent luxury villas, the Cretan Dream Villas, and is located between the towns of Agios Nikolaos and Sitia. The villa lies on one of the most amazing landscapes offering beautiful views of the surroundings, while it stands on a hillside. It offers panoramic views of the village of Mochlos, the sparkling waters of the Mirabello Gulf and the islet of Mochlos with its Minoan ruins. 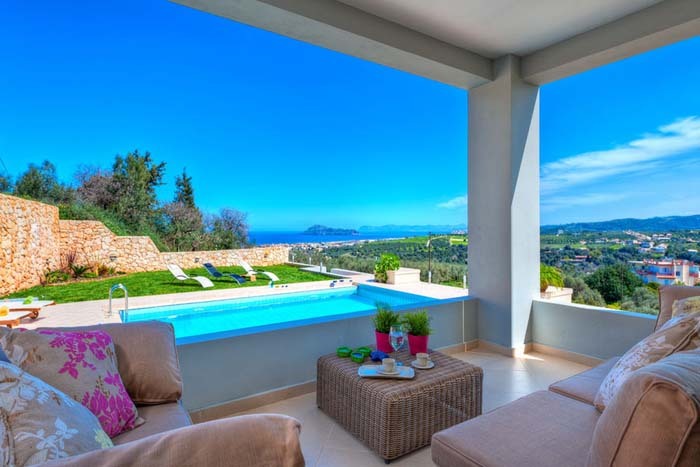 Villa Alkestis is independent and ensures privacy. It has four bedrooms, its own swimming pool, verandas, patios, greenery and parking space. The family hospitality, architecture of the villa, quality of service and peaceful environment make this villa and ideal choice for a relaxing holiday. 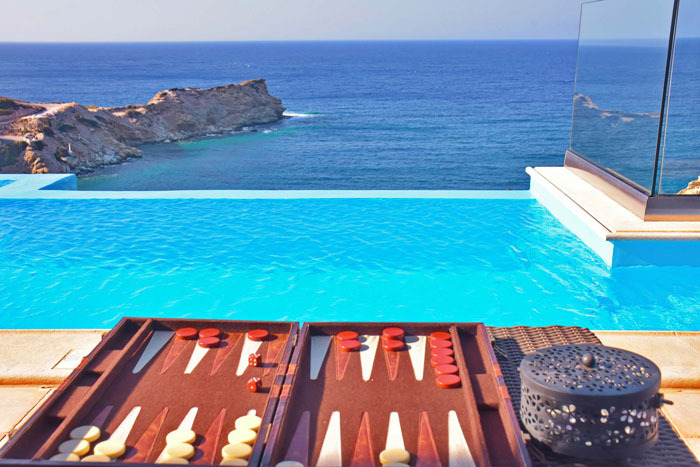 Villa Melitini is a 7 bedroom luxury villa located in the area of Akrotiri near the town of Chania. This stunning property has an 82sqm ecological- chlorine free private pool, spacious outdoor areas and an organic garden with vegetables available for the guests to consume. 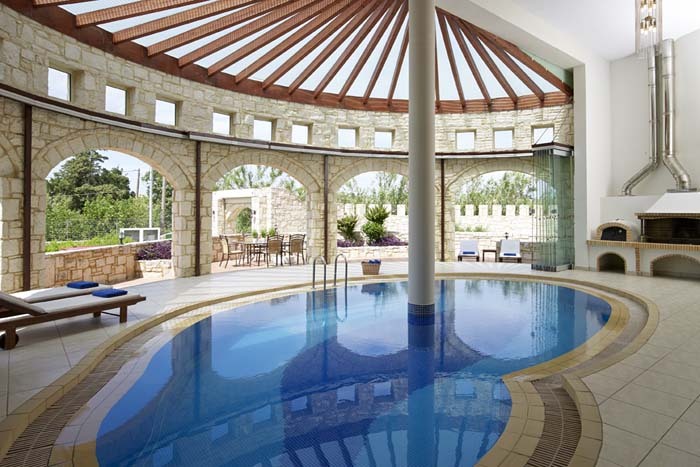 The villa has well equipped indoor areas with a range of facilities providing a relaxing and luxurious holiday! 10% discount for staying between 01.03 - 31.12. 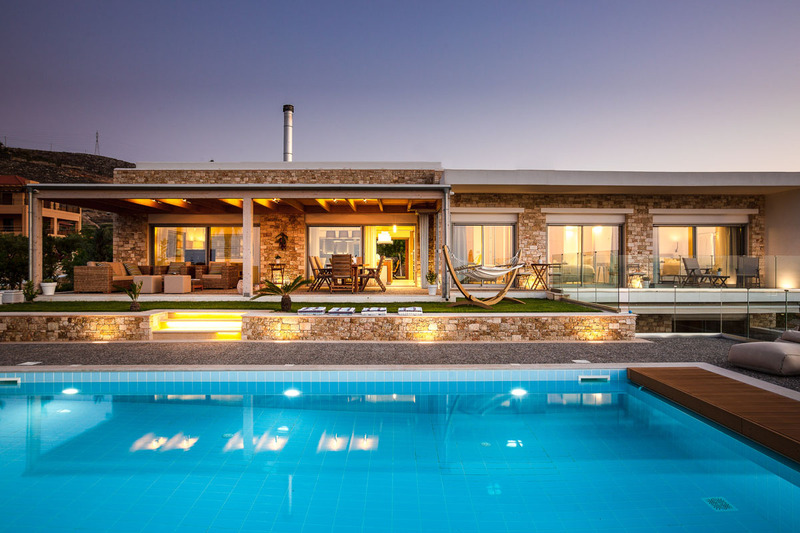 Villa Niba is a brand new, modern villa situated in the area of Kalathas near the town of Chania. 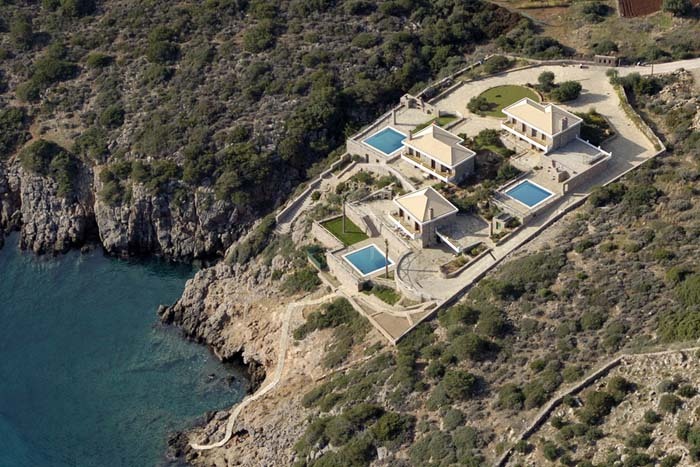 It stands on a plot right next to the sea and has immediate access to the clear waters of the Akrotiri bay. The main house has three bedrooms accommodating 6 guests while there is a separate studio that can sleep two more people, making this villa ideal for families or group of friends. The outdoor area features a private pool, a beautiful lawn garden and furnished areas all with majestic views of the landscape. Located in the beautiful area of Bali in the prefecture of Rethymno and built only a few minutes’ walk away from two sandy beaches is the brand new Villa Athina. The residence is built on three levels, has a 200sqm interior area, a garden, private pool with Jacuzzi, 3 stylish bedrooms and fully equipped kitchen and living areas. Situated in a quiet location and offering amazing sea views this luxury villa is an ideal accommodation for families or groups of friends. Villa Araucaria is a spacious 4 bedroom villa with a total surface of 250 sqm surrounded by a 300 sqm yard with plants and trees, an outdoor dining area with BBQ and a 22 sqm swimming pool with sun lounge chairs and a douche. The distance to the center of Rethymno is 3 km and the closest beach of Rethymno is at a distance of 1,8 km. The villa’s location right next to the national road of North Crete provides direct access to any tourist interest destination of the island, whereas on the third of it’s levels the view of the Cretan Sea, the White Mountains and the Venetian fortress of Rethymno is unique. 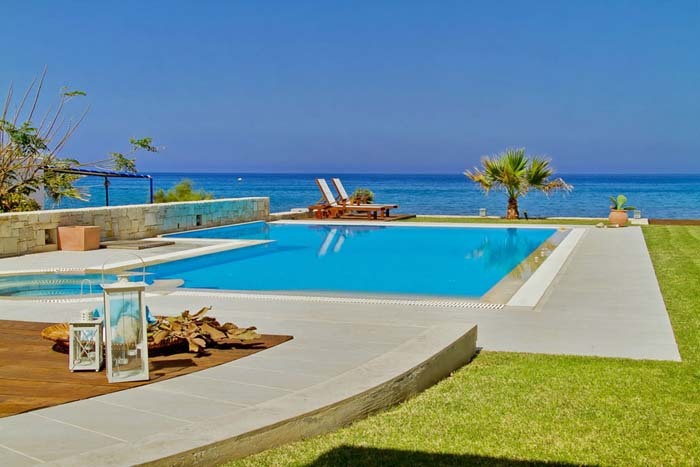 Villa Diamond is an amazing brand new, beachfront villa located near the cosmopolitan town of Hersonissos. The luxurious villa consists of three levels. It is built on a unique location only 2 meters away from the sea offering privacy, absolute relaxation, panoramic sea views and a superb accommodation to its guests. The villa has three beautifully decorated bedrooms that can accommodate 6 guests, a modern fully equipped kitchen, spacious and elegant living areas plus a studio that can be used for the staff. A private pool, a huge lawn garden, the outdoor sitting areas and the sea in front of the villa complete the stunning scenery and ensure that even the most demanding client will enjoy a holiday in heaven! Villa Harmony is a beautiful residense situated on a hill near the village of Pitsidia in South Crete, overlooking the Libyan sea and offering unforgettable views of the mountains Psiloritis. It consists of 4 ensuite bedrooms and has a stylish design and decoration.The property has an infinity pool featuring a Jacuzzi, a garden, spacious furnished terraces to dine or sit and relax and a well kept garden. The pool can also be heated on request. The Sea Front Elounda Villa is a brand new luxury residence, located in a dreamy spot next to the sparkling waters of the Elounda Gulf. It is a sister property of the Elounda Gulf Villas and is on the road to Plaka, only a 7 minute drive from the boutique Villa-Hotel. 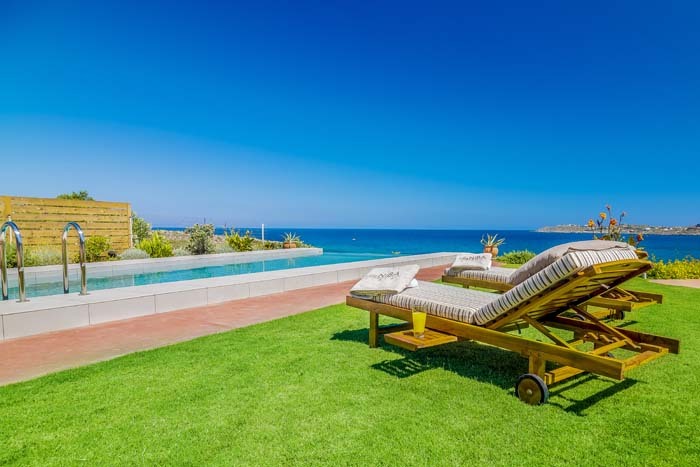 This stunning villa offers 4 luxurious bedrooms, two lavish bathrooms, fully equipped kitchen and a living area with outstanding views of the sea, pool and garden. Its stylishly decorated interiors combined with the spacious and serene exteriors promise its visitors a unique and unforgettable experience. 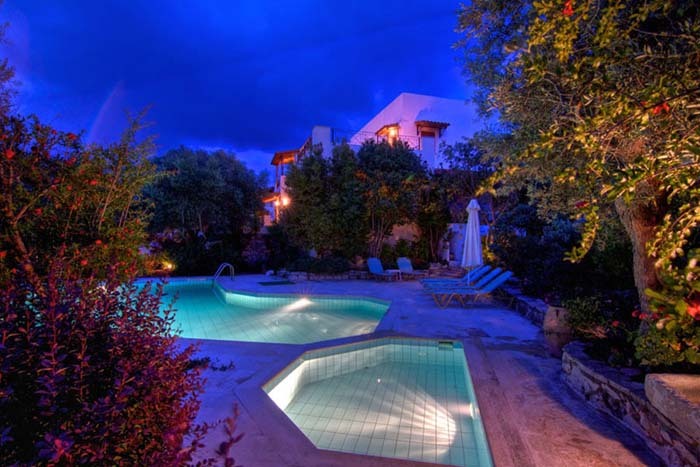 Villa Poseidon is a three bedroom, luxurious stone built villa. It is situated in the area of Koutouloufari near the cosmopolitan and lively resort of Hersonissos. It features a big private swimming pool and is equipped with all necessary amenities to offer its guests a comfortable and unforgettable stay. 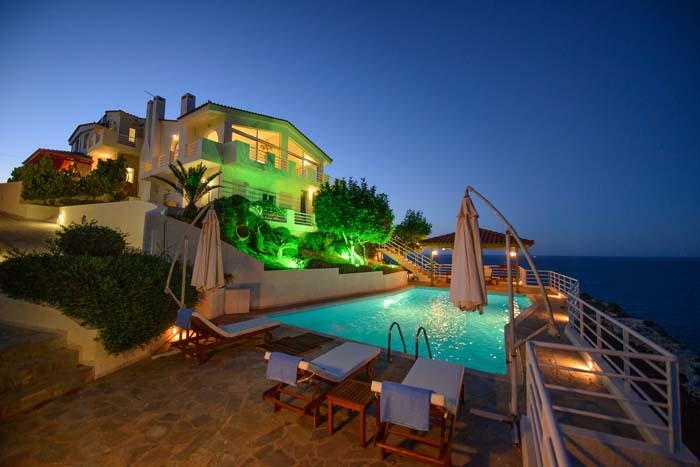 Villa Poseidon is decorated in natural and warm colours that create a welcoming and relaxing environment to its guests. Villas Oreades (Villa Armonia and Villa Dafni) are two beautiful villas situated in the area of Rethymno in Northern Crete. 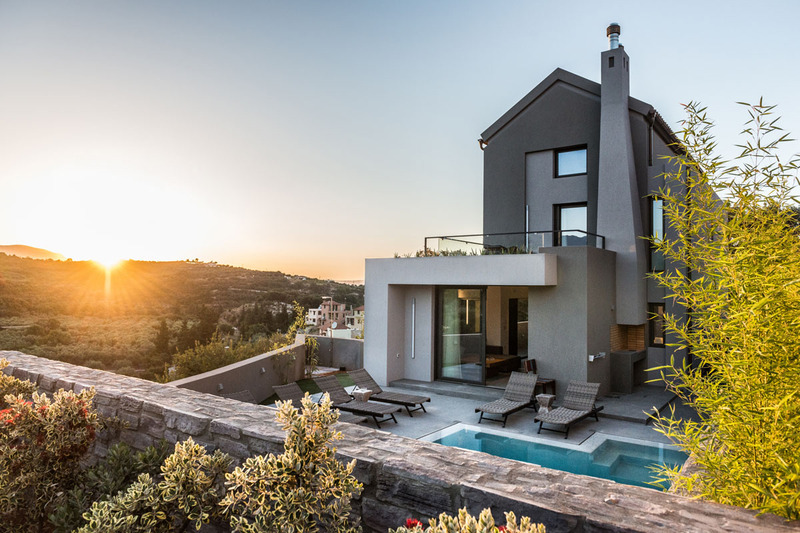 These unique, stone built villas stand on a hill, in a privileged and calming location overlooking the town of Rethymno and the Cretan sea. Each villa has 3 bedrooms and is decorated in a minimalistic style combining modern and traditional elements that create a cosy and warm environment. Their outdoor area includes a well kept lawn garden, a private pool and furnished terraces which you can enjoy at every minute of the day. 10% Discount for all bookings for staying between 01.04.16 & 31.10.16. Special Discount if renting both villas. Please inquire. 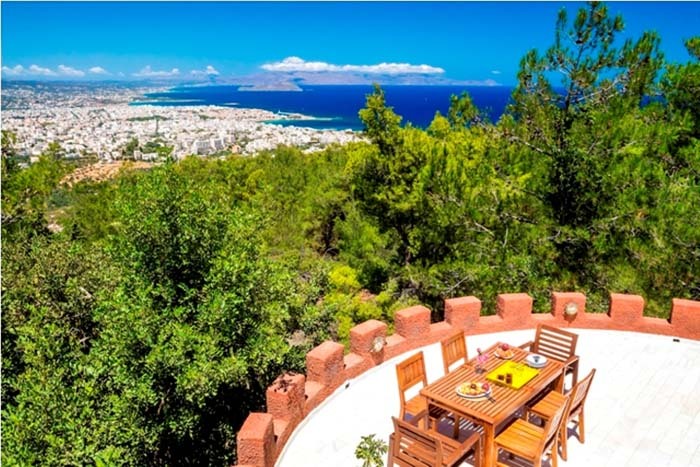 Villas Chromata is a complex of 4 beautiful, cosy villas that stand on a top of a hill in the area of Koutouloufari and overlook the cosmopolitan town of Hersonissos. The villas are identical in architectural design but they differ from each other as each of them is decorated in a different colour. The Red Villa, the Blue Villa, the Yellow Villa and the Green Villa. Each one these three bedroom houses offers a spacious and functional interior providing moments of rest and rejuvenation. Guests can relax at the private pool of each villa next to the wonderful gardens and enjoy the splendid, majestic views. 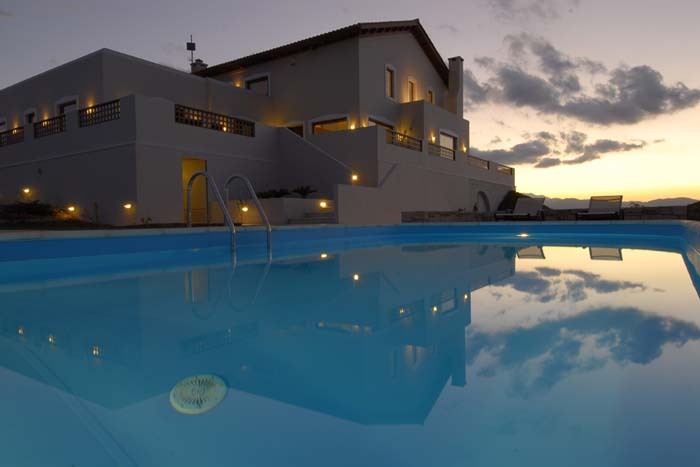 A 7 bedroom, seafront villa situated in the area of Tersanas, close to the picturesque town of Chania. Villa Peninsula stands on a 2.500sqm plot of land, on an idyllic spot next to the sea, providing amazing, panoramic views of the sparkling blue waters. The villa has a private swimming pool, is surrounded by a colourful garden while also has access to the sea via a small path. If you are looking to spend an unforgetable vacation in Crete with your friends or family, Grand Villa is a perfect choice for you. 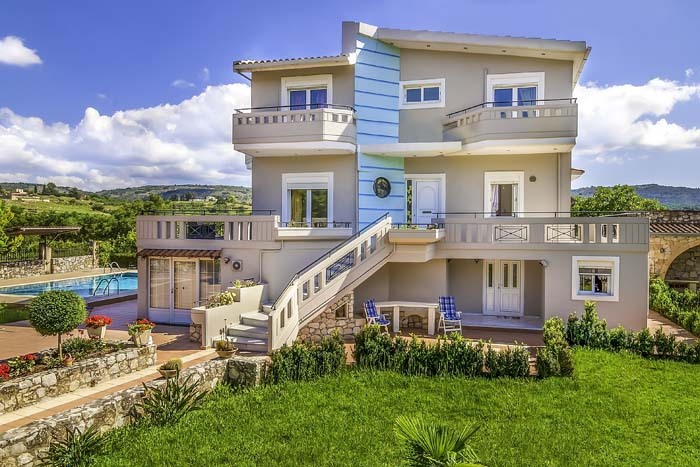 This 3 bedroom house stands on top of an olive grove on a small hill offering sstunning panoramic views of the sea and is situated only a short distance away from the famous beach resorts of Maleme and Platanias and the picturesque city of Chania. Villa Grand has a unique and minimalistic design which is matched ideally to the tranquility of the surroundings promising a luxurious and relaxing holiday. The stylishly decorated interiors and all modern amenities that the house offers ensure a comfortable stay for its guests while the huge lawn garden, the private pool and bar-BBQ area will surely make you want to come over and over again. Villa Harmony is a brand new villa that belongs in a villa complex, the Euphoria Villas. The villas are situated in a privileged spot in Western Crete, the village of Agios Georgios near the small town of Kissamos. These private villas are designed to provide a luxury holiday to their guests and emphasise on the indoor modern decoration but also on the outdoor relaxing area. The complex stands on a hillside overlooking the Gramvousa Peninsula and the sparkling turquoise waters of Kissamos Bay. Villa Harmony has two bedrooms, a private pool and terrace while it is fully equipped to serve the needs of its visitors. Villa Phaidra is a seafront luxury villa situated in the tranquil area of Tersanas- Akrotiri, near the cosmopolitan town of Chania. The villa can accommodate up to 14 people in 7 spacious bedrooms, it is decorated in a stylish way and offers its guests all the amenities that will ensure a comfortable and luxurious stay. The property has a private pool that seems to float on the endless blue that lies beneath while the sunsets that can be enjoyed from the outdoor will be unforgettable. 15% Discount for all bookings for staying between 01.09 - 31.10. 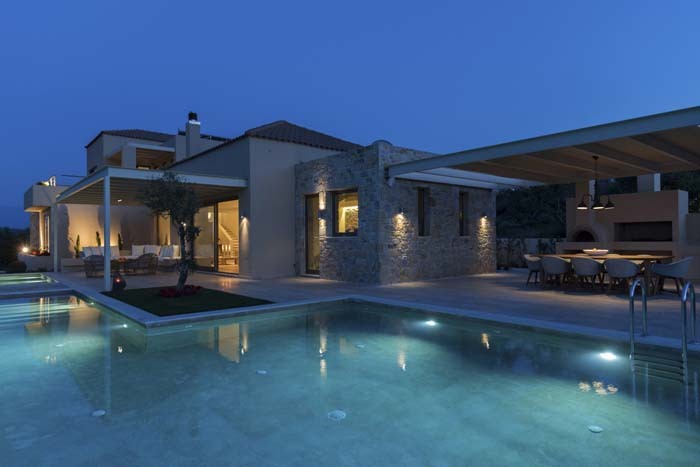 Villa Almyra is a luxurious three bedroom villa, located in the area of Almyrida near Chania. The villa embraces the unique panorama of the mountain merging into the blue sea, offering inspiring views to its visitors. The decoration is modern- minimal combining contemporary elements and traditional architecture creating elegant and stylish indoors and outdoors. Glass doors allow the maximum of the sunshine in the house and open on to the terrace and big pool terrace that appears to float over the sea. Situated in the small traditional village of Prines, near the town of Retymnon, Villa Prines is a spacious 200sqm villa decorated in a traditional Cretan style and providing all the modern amenities to its guests a comfortable and luxurious accommodation. The villa has 4 bedrooms and three bathrooms and is a perfect choice for those who are looking forward to a relaxing holiday in the unspoilt Cretan countryside. The property has a private swimming pool and children`s pool, furnished terraces and is surrounded by a garden with local trees and flowers offering privacy to its visitors. Villa Knossos is located in an idyllic setting at the top of a hill looking over the long sandy beach of Almyros, near the town of Agios Nikolaos. The views of this top quality, glamorous, newly built exclusive villa is as close to heaven as one could possibly get. Surrounded by stone-walled courtyards, Villa Knossos ensures privacy and represents the ideal scenery for long romantic walks, candlelight dinners on the terrace and timeless memories. 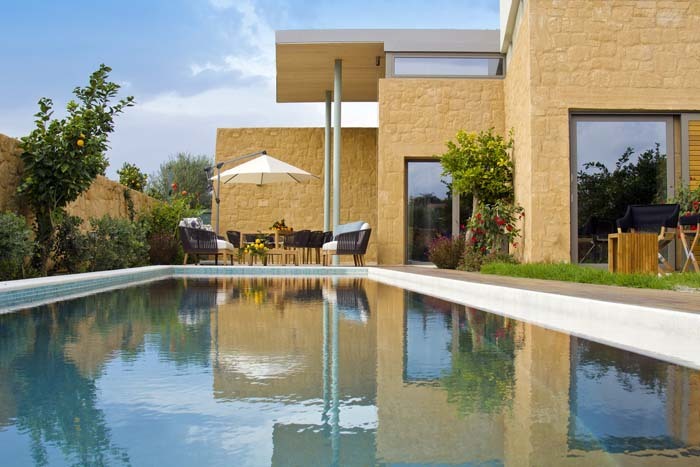 Villa Deluxe is a stunning 280sqm contemporary villa located in the area of Tersanas, near Chania. It has 5 bedrooms that accommodate 10 guests, stylishly decorated indoors, spacious outdoors, a garden and a private 50sqm pool. The property is equipped with all modern amenities that guarantee a sense of autonomy, comfort and luxury. Villa Thalassa is a brand new villa that belongs in a villa complex, the Euphoria Villas. The villas are situated in a priviledged spot in Western Crete, the village of Agios Georgios near the small town of Kissamos. These private villas are designed to provide a luxury holiday to their guests and emphasise on the indoor modern decoration but also on the outdoor relaxing area. The complex stands on a hillside overlooking the Gramvousa Peninsula and the sparkling turquoise waters of Kissamos Bay. Villa Thalassa has three bedrooms, a private pool and terrace while it is fully equipped to serve the needs of its visitors. 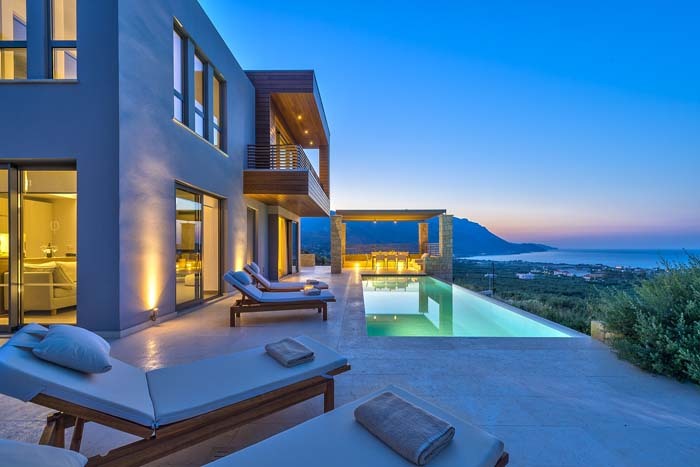 Villa Orangia is a brand new, modern and luxurious villa located in the village of Kontomari in the area of Platanias, Chania. The villa belongs in a complex of three residences but offers absolute privacy and promises comfort and relaxation to its guests. The villa has 3 stylish bedrooms, two bathrooms, a private swimming pool, high quality furnishing and stylishly designed interior and exterior areas that will meet the expectations of even the most demanding customer. Villa Orangia is a perfect choice who are seeking a hideaway retreat with chic luxury, privacy and mesmerizing beauty. 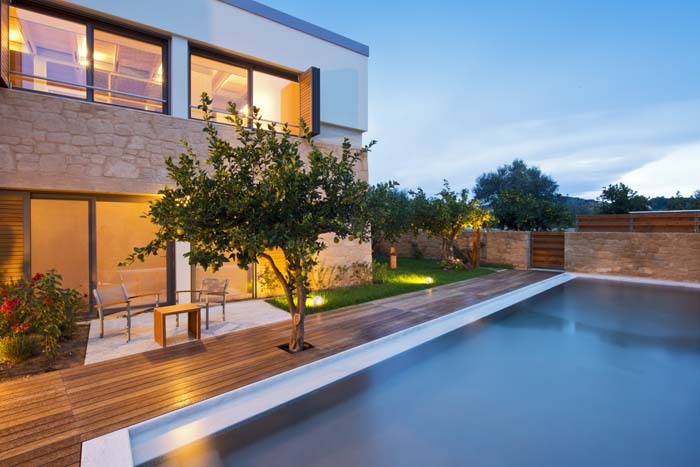 The Eleon Residences, Villa Okalia and Villa Alea, are two independent and luxurious villas each with its own pool, garden and terraces located in the area of Stavromenos-Nea Magnisia, 9klm away from the picturesque city of Rethymno. The villas offer three bedrooms that accommodate 6 guests, and fully equipped living areas. They are decorated in an elegant, country chic style and provide discrete luxury and comfort. The Eleon Residences are built with respect to nature and blend harmoniously with the beautiful landscape while the views of the immense light blue Cretan seas and the mountain of Psiloritis are gorgeous. Villa Lilium is a 900sqm villa located just a 5 minute walk from the beautiful beach of Maleme, in the prefecture of Chania. The villa is set on five levels (including a traditional cellar) which are connected with elevator and stairs. It consists of 8 bedrooms (two of them studios with kitchenettes), 7 bathrooms, a fully equipped kitchen and spacious living areas. The outdoor area of the villa is 4.000sqm and has a beautiful lawn garden, huge private pool, a BBQ area and spacious terraces. Located really close to the sea, near shops and restaurants yet in a quiet spot, this villa is a perfect choice for large groups that are looking for an unforgettable holiday in Crete. 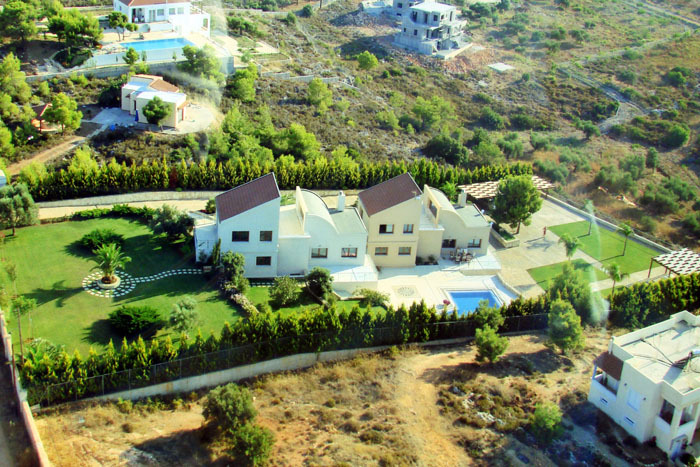 Villa Oneiro is a brand new villa that belongs in a villa complex, the Euphoria Villas. The villas are situated in a priviledged spot in Western Crete, the village of Agios Georgios near the small town of Kissamos. These private villas are designed to provide a luxury holiday to their guests and emphasise on the indoor modern decoration but also on the outdoor relaxing area. 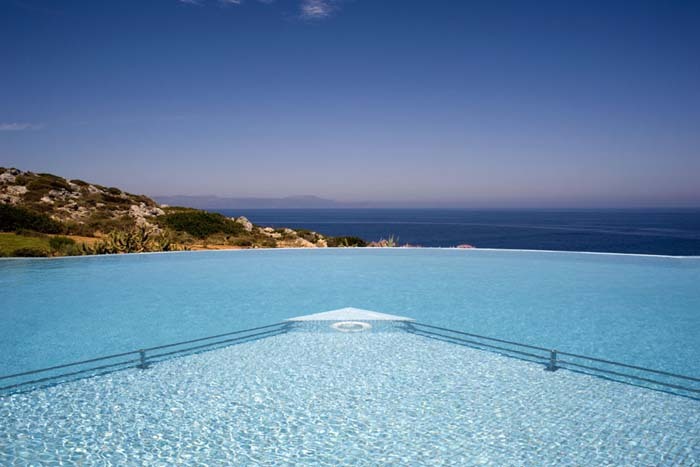 The complex stands on a hillside overlooking the Gramvousa Peninsula and the sparkling turquoise waters of Kissamos Bay. 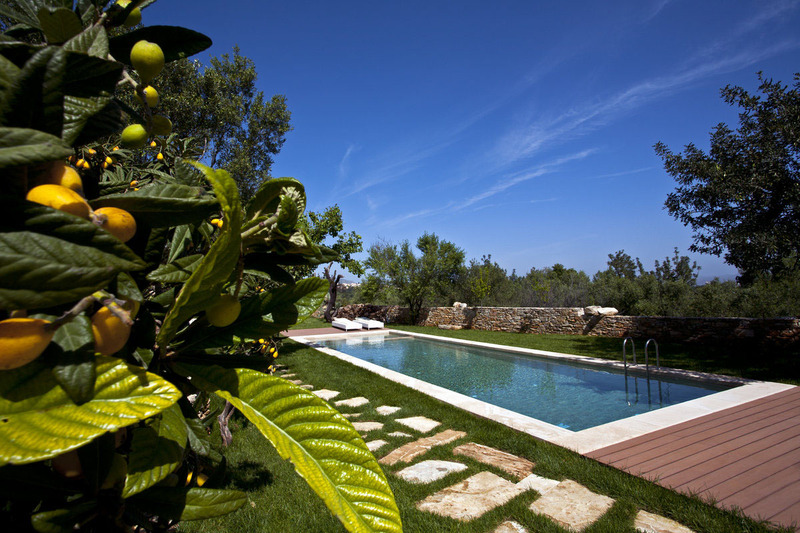 Villa Oneiro has two bedrooms, a private pool and terrace while it is fully equipped to serve the needs of its visitors. Villa Mediterranean is 3 bedroom, luxury and fully equipped villa situated in the beautiful area of Agia Pelagia, about half an hour from the city of Heraklion. The villa stands on a hill offering h breathtaking views of the Lygaria bay and the crystal clear waters of the Cretan sea while a sandy beach is only a 5 minute walk away. This spacious and modern residence due to its unique location allows its guests to be close to the crowds of Agia Pelagia and Heraklion whilst still enjoy the peace and seclusion of its idyllic setting. The Pegasus Villas is a four villa situated near the village of Malathiros in Western Crete, a peacefull and beautiful location. These cosy villas are built with respect to tradition and nature combining stone and wood, are fully equipped and have one or two bedrooms and can accommodate 2-6 guests, while some of them also feature a private pool. 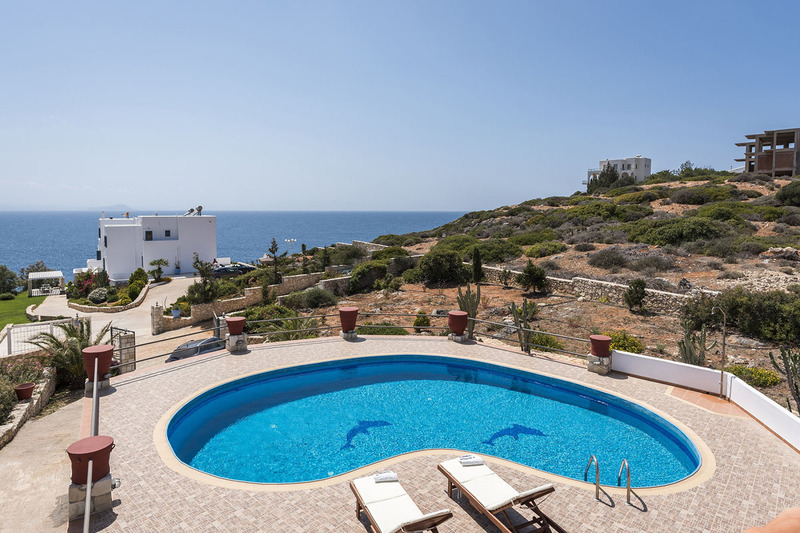 Pegasus Villas offer stunning views of the Gulf of Kissamos and even the island of Kithira and are available for rental all year round. Villa Asteri is a 3 bedroom brand new villa, built in 2014 in the traditional village of Asteri in the prefecture of Rethymno. The construction of the villa corresponds to the modern statutory energy saving standards and preserves fully the traditional Cretan character and the local cultural and environmental standards offering its guests a high level of comfort during their stay. 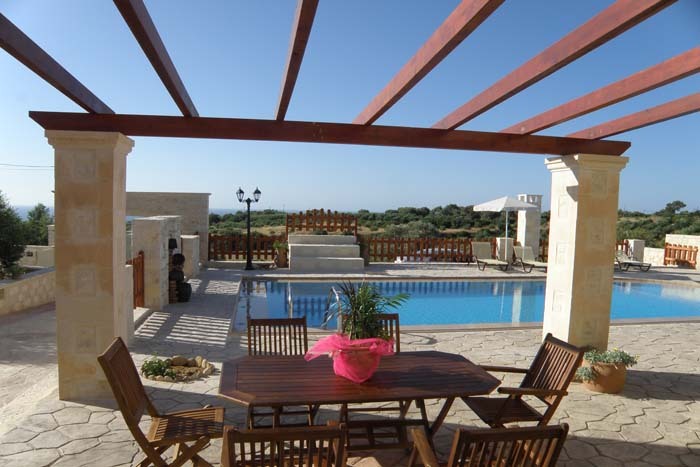 Villa Star is a newly built 4 bedroom villa located in the village of Asteri east of the Venetian town of Rethymno. 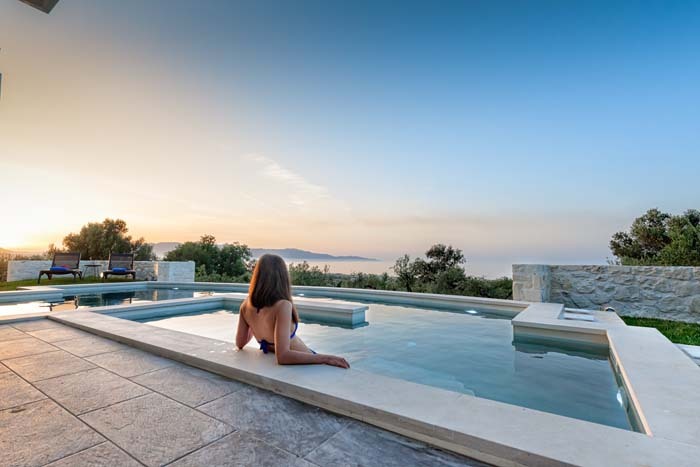 This beautiful stone house offers a private swimming pool with hydro massage and children’s’ area and an impressive roof veranda with panoramic views of the mountains, sea and olive grounds around. Equipped with all the modern facilities and decorated in a Cretan traditional style, Villa Star is a perfect choice of accommodation for a relaxing holiday in the Cretan countryside. 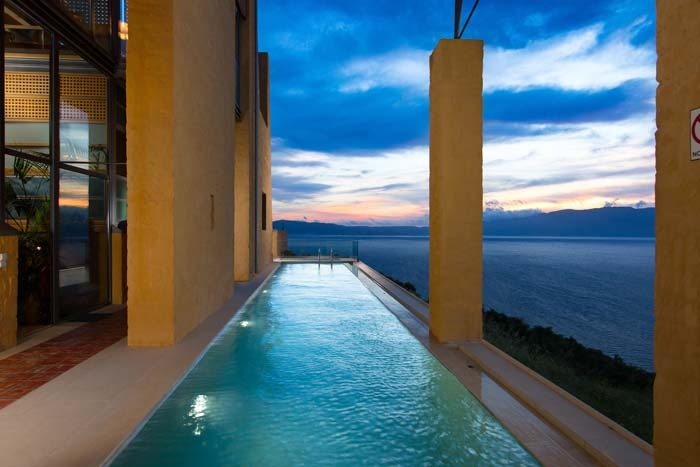 Casa Scordilli is a 815sqm luxurious residence, built on a 11.500sqm plot of land in the area of Akrotiri- Chania and offers magnificent panoramic views of the Souda Bay and the White Mountains. It is set on three floors, with spacious luxurious interior areas, 5 en suite bedrooms, two living rooms and a unique stylish design and decoration. The villa has a huge outdoor area with a private pool, dining and sitting areas and a marvelous garden with lawn, exotic and local trees and plants that create a magical atmosphere that promises a comfortable and luxurious accommodation. A restored, stone built, luxurious villa located in the village of Sgourokefali 18 klm from Heraklion. The restoration of this two storey villa was made with respect to tradition in order to maintain the character of the residence. 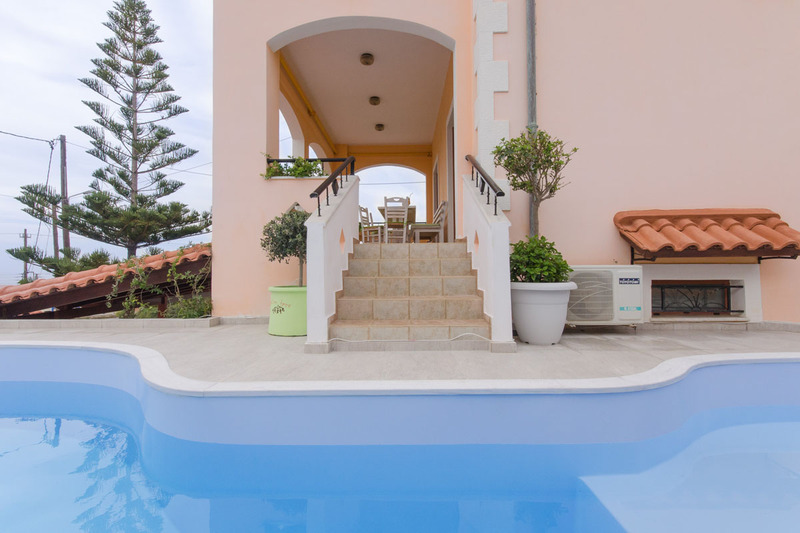 Villa Agrielia has three bedrooms and is equipped with everything one can ask to ensure a comfortable accommodation. The house has a pool and spacious terraces with flowers and trees and is ideal for visitors who want a relaxing and luxurious holiday to unwind from the urban stress. The property offers a private swimming pool, verandas and well-kept garden and is considered a perfect choice for families and groups of friends looking for a wonderful, relaxing holiday in Western Crete. 10% Discount for all bookings for staying between 01.01 & 31.12. Villa Iokasti is an elegant 4-bedroom villa built on the top of a hill, in the tranquil village of Gerani near the Venetian town of Chania, with panoramic views over the Cretan sea, the Island of Theodorou and the mountains. The 200sqm villa is set on three levels on a 3.500sqm plot of land and is a perfect choice for families with kids, couples or groups of friends, as it can comfortably accommodate up to 8 guests. This elegan holiday home offers spacious areas, a kitchen with all the facilities, three en suite bedrooms plus an independed studio with its own kitchen and bathroom. 10% discount for all bookings made by 31.05. 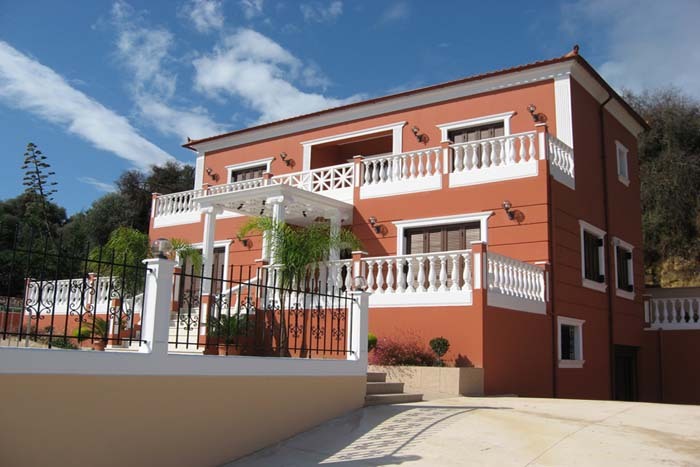 Villa Anemos is a three bedroom villa located in the area of Almyrida- Chania. 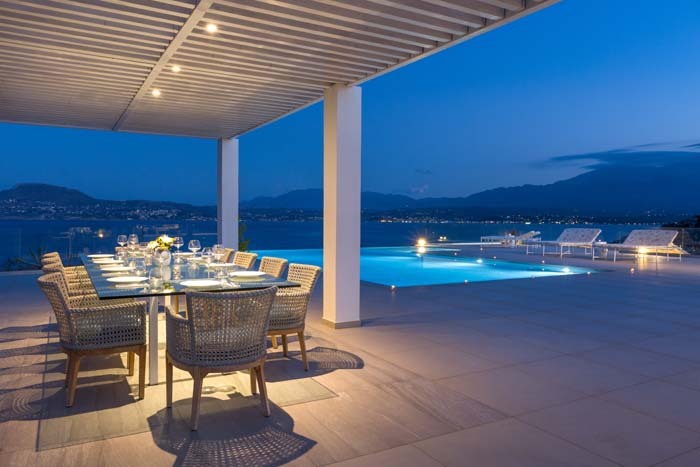 This seafront luxury villa is built in a idyllic location offering breathtaking views of the Souda Bay and the White Mountains. Its interior is decorated in an Cretan traditional style, with family owned antique furniture pieces, wooden floors, warm colours and rich fabrics. The outdoor area with the private infinity pool, elegant furnished terraces and beautiful garden will relax and satisfy even the most demanding guest. Villa Pitsidia is a three bedroom marvelous villa sitting on the slopes of a small hill near the village of Pitsidia in South Crete. The villa was built in 2010 and is designed and decorated combining stone and wood which creates a feeling of warmth and relaxation to its visitors. 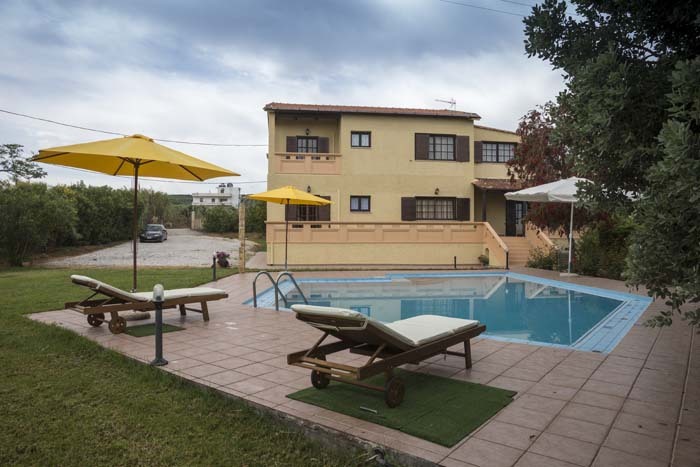 The house is stands a 200sqm land plot surrounded by olive groves and has a well kept lawn garden, a private pool and shaded furnished areas where you can relax and enjoy the most of the Cretan landscape. Its location is ideal for families and groups of friends while it is close to some of the most exotic sandy beaches in South Crete. 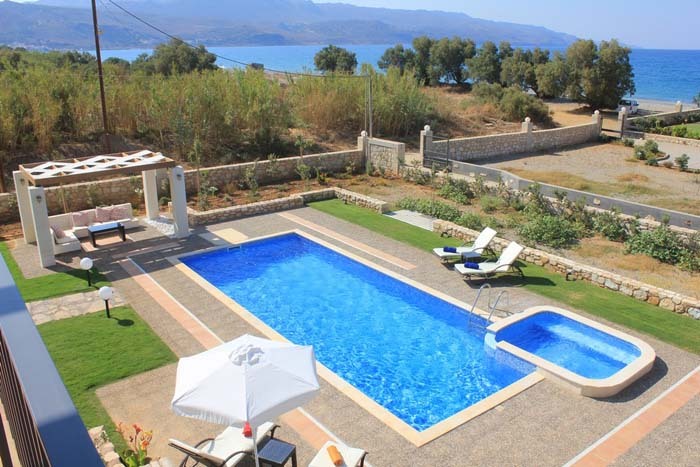 Loutraki Villas is a luxurious complex of two independent villas located in a four acres plot of land in an olive grove, overlooking the beautiful Loutraki bay near Chania. The architectural desigh of the villas features airy rooms and large windows while the pastel interiors combine simple elegance with comfort and luxury. Each residence has three bedrooms, fully equipped indoor areas, spacious furnished terraces and a private pool. Villa River is a beachfront villa situated just a few meters away from the sandy beach of Almyros and the river of Almyros, outside the town of Agios Nikolaos. The house is built with traditional materials such as rock and marble and consists of the main house and one independent studio. In total it can accommodate up to 8 guests in 4 bedrooms. 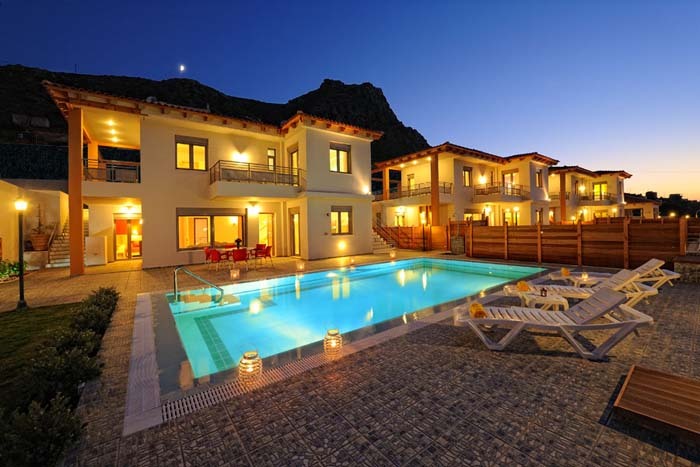 Petra 1 belongs in a complex of four independent villas located in the area of Kato Gouves, on the north coast of Crete. The villa combines the characteristics of the traditional Cretan architecture with those of modern design which creates a marvelous and luxurious holiday home. Saint Antoine Villa is a three-storey 470 sq. m villa, combining a space of high aesthetics and superior quality materials with an architectural concept that intertwines indoor and outdoor areas. The villa has 5 bedrooms and can accommodate a total of 12 guests with the whole building and facilities made by high quality throughout. Great care and attention can be seen in every detail including Cocomat ecological bed mattresses, designer furnishings made by Italian and Greek designers and designer dinnerware sets to add to this unique atmosphere of supreme contemporary living. Blue View Villa is a beutiful 250sqm, 5 bedroom luxury villa located near the town of Agios Nikolaos, offering stunning views of the Mirabello Gulf and this picturesque town in Crete. This spacious house has 5 beautifully decorated bedrooms, a luxurious indoor area and a relaxing outdoor living space. The villa has a fully equipped kitchen, all modern facilities and promises absolute relaxation during your holiday. 35% Discount for all bookings for staying between 01.06 - 30.06. 30% Early Discount for all bookings for staying between 01.04 - 31.05 & 16.09 - 31.10. 20% Early Booking Discount for all bookings for staying between 01.07 - 15.09. 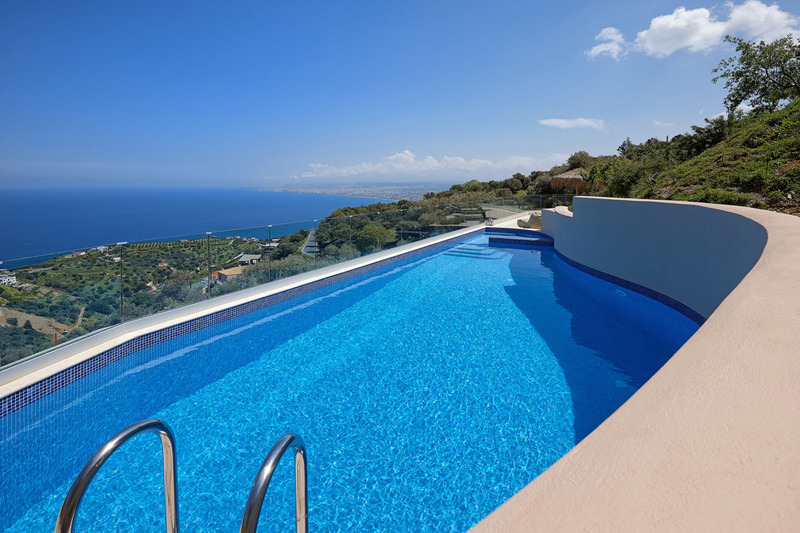 Perched atop a seaside mountain, overlooking the gorgeous Mediterranean Sea, is Villa Bella Mare. 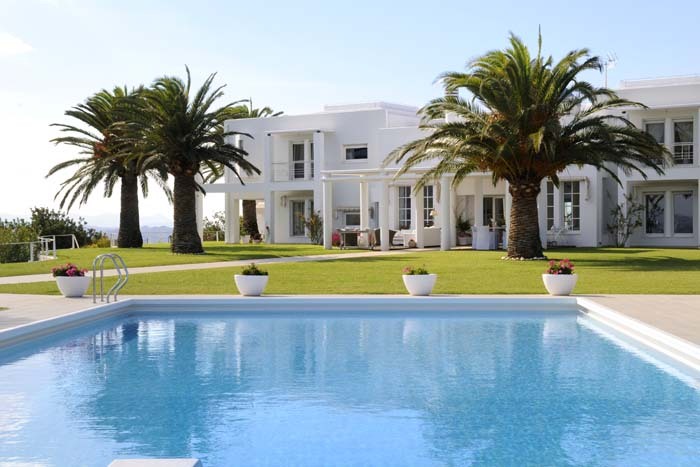 Bella Mare is a small stone mansion furnished with the finest luxuries. We spared no expense to make it the perfect vacation villa for the discerning traveler who expects nothing less when staying in one of the most beautiful corners of the world. Here, the traveler encounters a truly private retreat, protected and surrounded by strong yet elegant stone walls that are evocative of the ancient walls surrounding the city of Heraklion, left by medieval Venetian Settlers. Within the walls and surrounding the house are glorious garden paths that evoke ancient gardens from antiquity. Villa Athina is a luxurious villa with a unique architectural desingn, situated on a hill overlooking the bay of Kissamos near the city of Chania. The villa has a modern and stylish decor which will impress even the most demanding guest. Villa Plumeria is located in an enviable secluded position, only 40 meters from the sandy beach and local amenities at Tersanas, boasting a very high standard of spacious accommodation near to Chania. 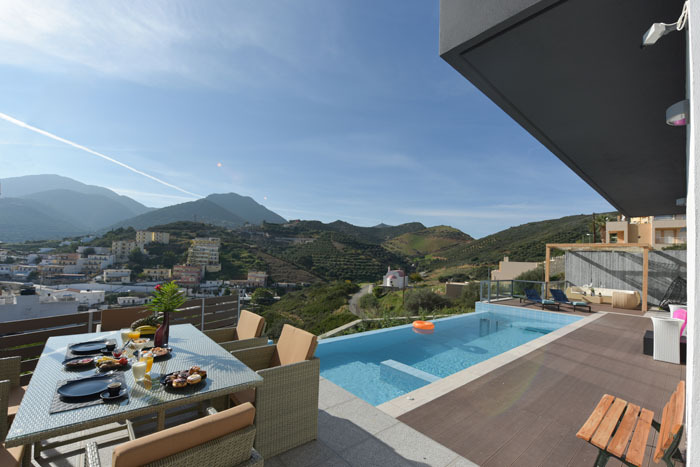 The villa offers panoramic sea and mountain views whilst providing plenty of privacy for a couple, a family or a group of friends. It is situated in a quiet and picturesque location, built over two floors and decorated in a modern style very well equipped. The impressive interior with its large windows and doors give a light and airy feel with bright lighting and colorful pictures adding to its appeal. Outside there is a wonderful swimming pool with a separate children`s pool and play area, all within a colorful garden setting. The beach and its bar/taverna is only a 2 min walk away from the villa and across the road is a small chapel which is ideal for weddings and baptisms. A further 5 mins walk brings you to the village where you will find tavernas and a supermarket together with a regular bus route into the city of Chania. 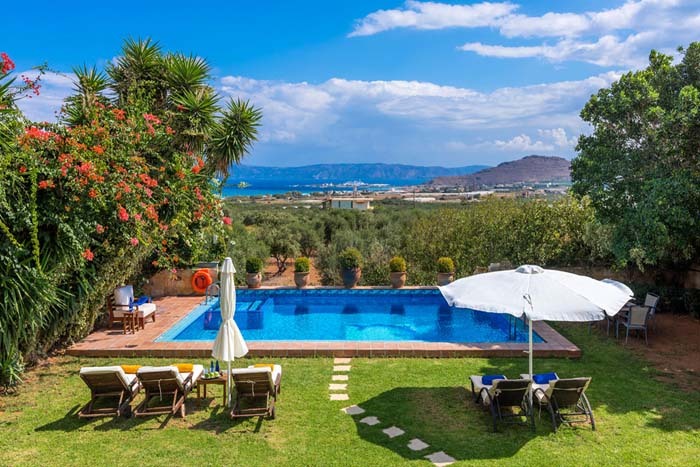 Villa Dahlia is a traditionally decorated private villa located only a few meters away from the beach in the area of Maleme, near the city of Chania. The villa accommodates 6 guests in three bedrooms and offers a private pool, garden and all modern amenities that ensure its guests a comfortable stay. Villa Blanche is a three-storey 200 sq. m villa and has been designed to make you feel at home, through its rather modern, airy and hospitable character. It can accommodate 11 people in beds in its 5 bedrooms, making it perfect to host up to two families travelling together. Villa St Nicolas is a luxury 4 bedroom villa which is situated on the outskirts of the cosmopolitan and picturesque town of Agios Nikolaos. 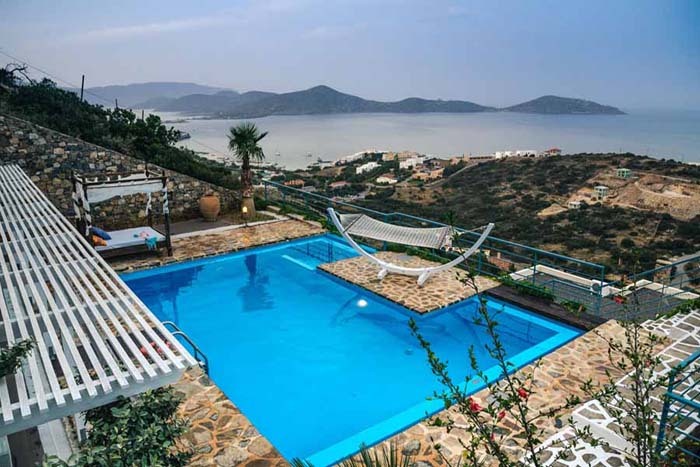 This impressive villa stands in its own grounds offering wonderful views of the Mirabello Gulf, the town of Agios Nikolaos and the mountains of Sitia. 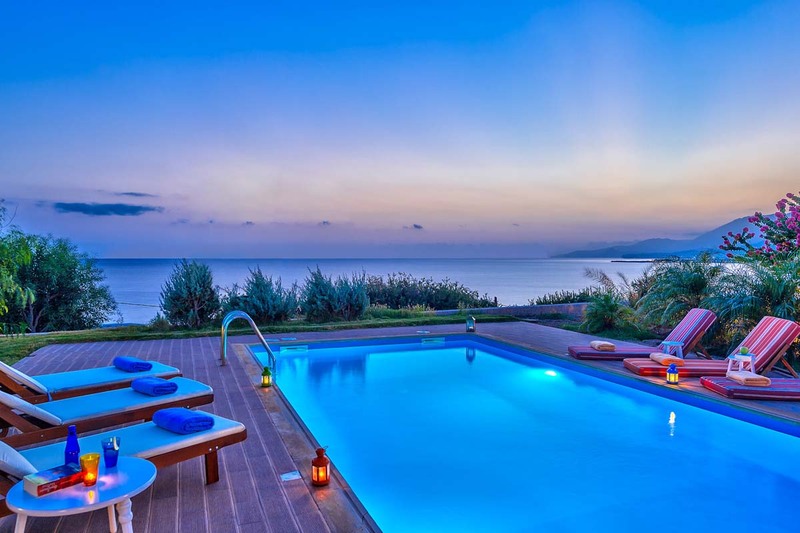 This amazing villa has its own private swimming pool with a Jacuzzi and is a perfect choice for couples, families or group of friends who are looking for a luxurious accommodation in the sunny island of Crete. Special offer 200,00 euro per night for the period of 29.04 - 06.05. 40% Discount for staying between 14.05 - 28.05. 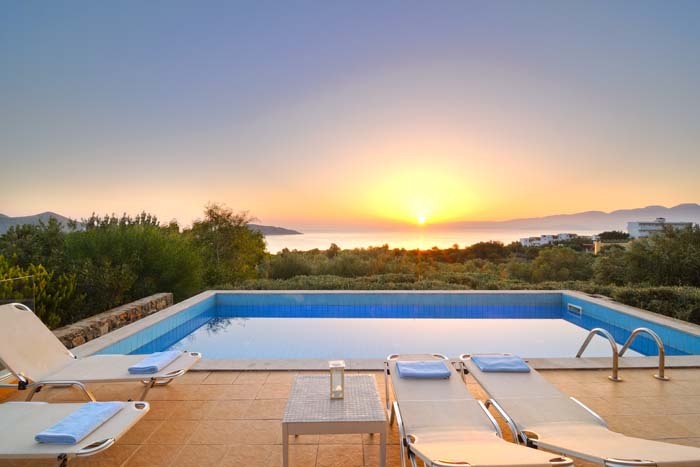 Villa Artemis sits atop the hilltop area of Rogdia, overlooking a breathtaking view of the deep blue sea of Crete. The views of the Sea and the gulf of Crete, surrounded by pastoral green hilltops and countryside place the visiting guests in a state of peaceful relaxation and regeneration. The villa can accommodate up to 10 people comfortably and is comprised of three levels of living space. There is a private pool and Jacuzzi overlooking the gorgeous Sea of Crete, surrounded by a lovely garden of flowers and fruit trees. The guests will feel at home in the spacious surroundings, but will feel like they have been transported to a beautiful, exotic sanctuary of Mediterranean sky and sea, softened by gentle cool sea breezes. 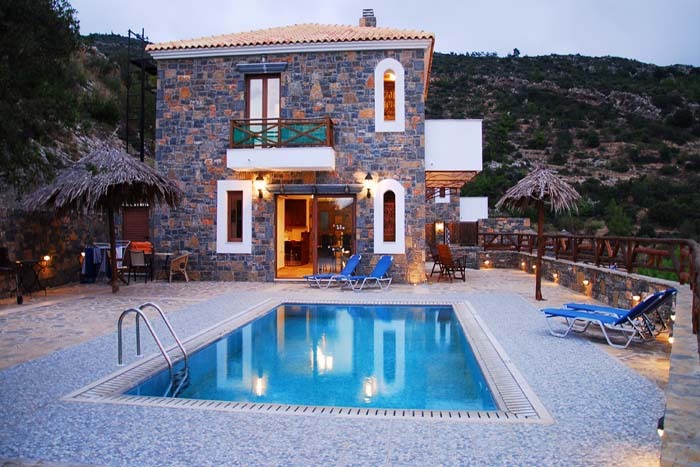 Villa Arhontariki is a beautiful, cosy villa located in Western Crete, in the area of Kissamos, Chania. The villa has a traditional Cretan design, combining stone and wood and is furnished with Cretan antiques that create a warm, welcoming and unique environment. The villa has 5 spacious bedrooms accommodating 10 guests, a private pool with a Jacuzzi, a large fully fitted kitchen, a play room with gym facilities and a Hammam. 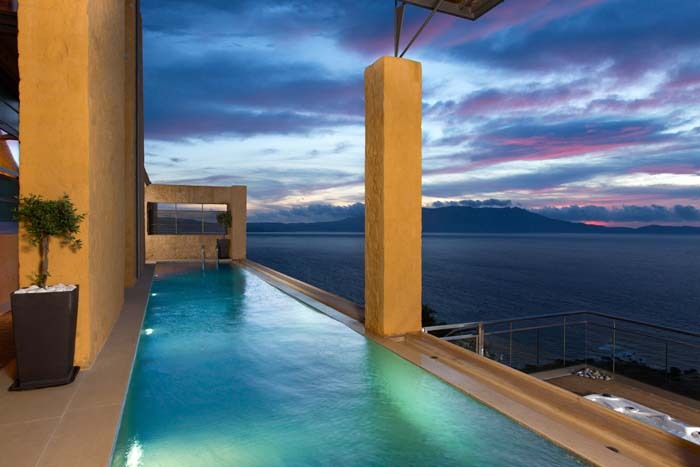 It is built on three levels all offering stunning views of the Kissamos bay and the surrounding countryside. 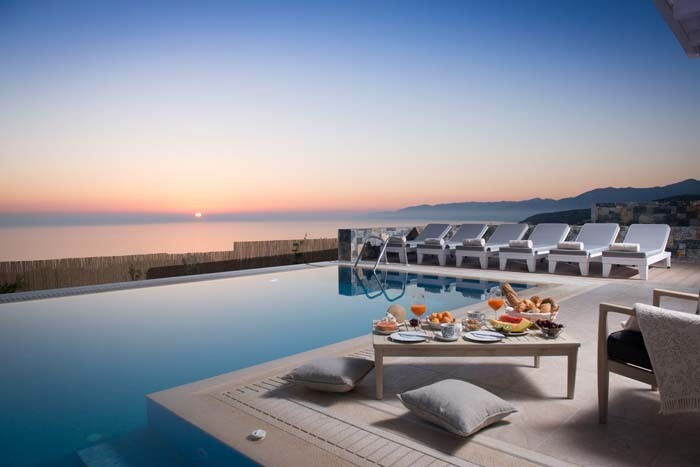 Rimondi Grand Resort and Spa is a luxury suite and villa resort situated on the slopes of an olive tree plantation, overlooking the Cretan Sea, close to the historical Venetian town of Rethymno. The peaceful setting guarantees a tranquil and unforgettable vacation. 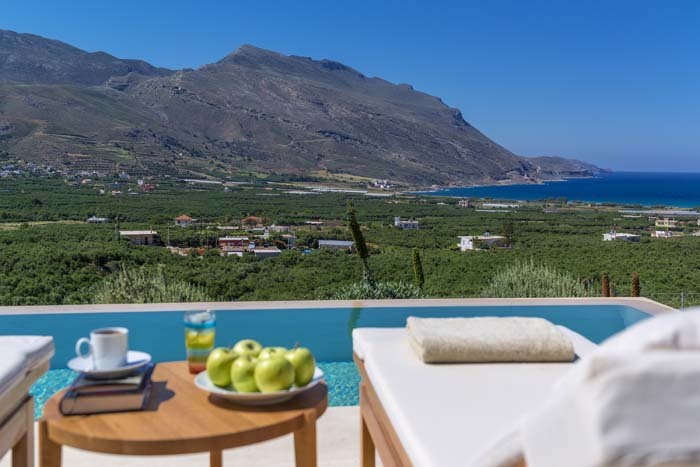 This luxurious resort consists of private villas and spacious suites and is the perfect starting point to explore the Rethymnon prefecture as well as the entire island of Crete. Chorafakia Villas is a complex of 5 beautifully decorated villas situated in the village of Chorafakia, in the area of Akrotiri only 10 minute drive from the amazing city of Chania. The villas have 2-3 bedrooms, a bathroom with a modern walk- in shower room, a fully equipped kitchen, a living room and a dining area with high quality furniture, a private garden and balconies. All villas offer all the modern amenities to ensure a comfortable stay such as satellite TVs, internet access and more. The complex has a 90sqm shared pool with sun beds and umbrellas, a huge lawn garden with local trees and flowers, 2 stone BBQs and a pergola covered seating area. Chorafakia Villas are an ideal choice for families and friends who are looking for a quiet and peaceful place to spend their holiday in Crete. 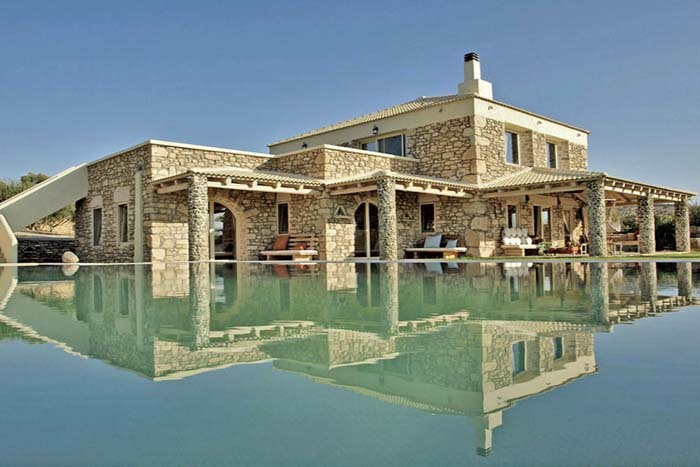 Villa Hermes is 380sqm, stone built villa located near the village of Polemarchi, 25 km west of Chania. The spacious house is built on three levels connected with a lift and offers five bedrooms, five luxurious bathrooms, a fully fitted kitchen and a gym/ game room. 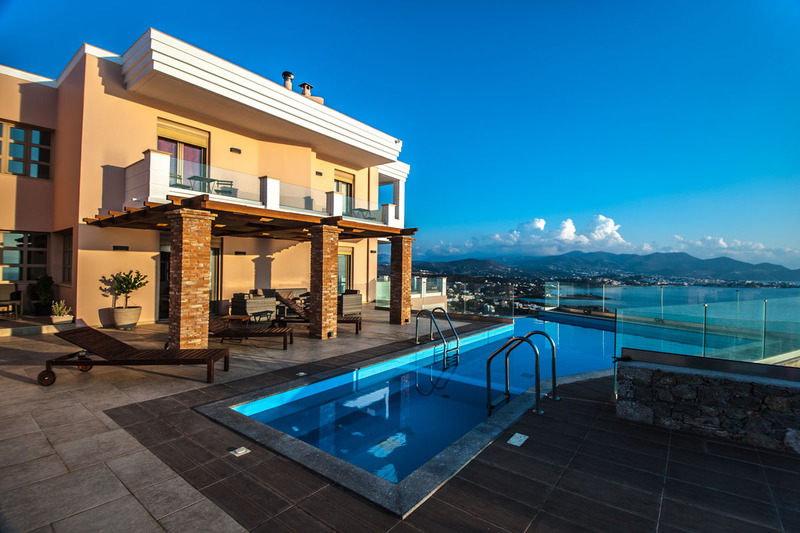 It offers absolute privacy and features a private pool with a hydro massage and a children’s area, lawn gardens and furnished terraces all offering with incredible views of the sea and mountains. 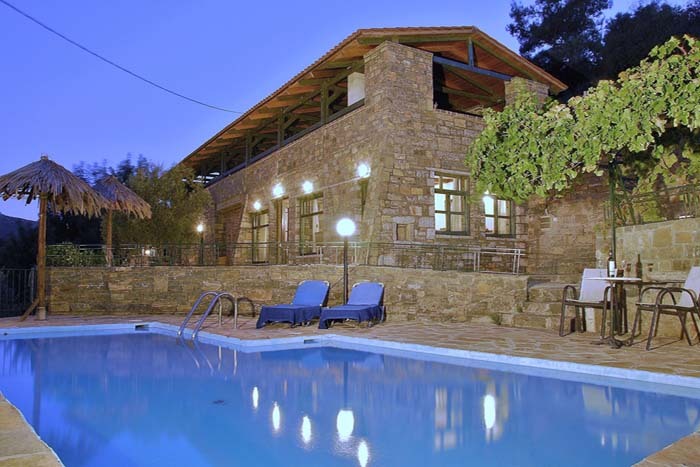 Villa Carobee is located on a hillside outside the tourist resort of Hersonissos. The house is set on a relaxing environment surrounded by trees and local plants and offers magical views of the sea. It features three stylish bedrooms and nicely decorated living areas, an eco- friendly pool, a children’s pool and furnished terraces. 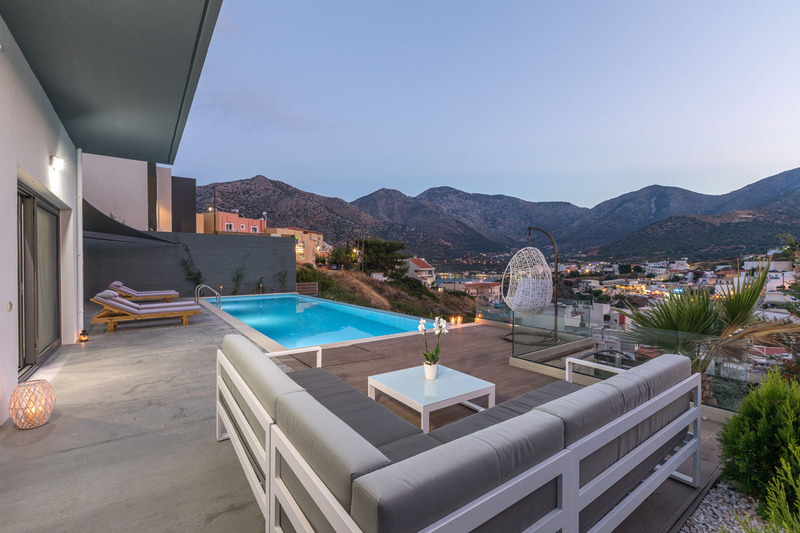 Villa Bellelen is brand new, modern villa, built in 2016.The chic and luxurious residence is situated on a privileged spot, on a hillside just outside the beautiful town of Agios Nikolaos. It can accommodate up to 11 people in 5 bedrooms and offers a range of facilities, modern appliances and stylish interior areas to ensure a comfortable stay. Villa Bellelen has a 270sqm outdoor area, with a well-kept lawn garden, huge swimming pool, BBQ area and an outdoor sauna that guarantee a unique holiday for its guests. Special Offer 10% discount for staying between 01.01 - 30.06 & 01.09 - 31.12. 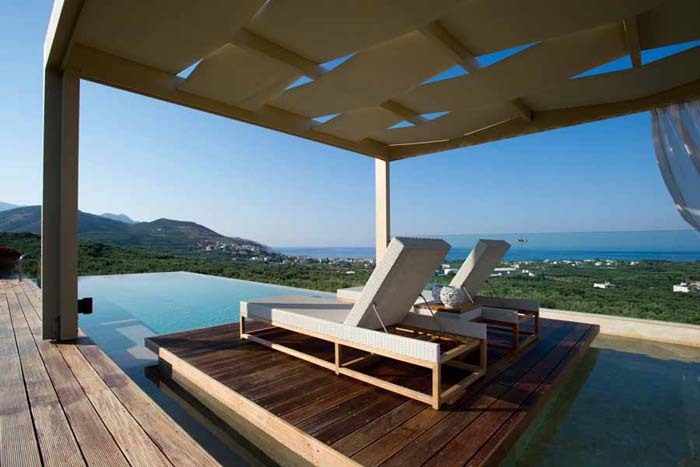 Villa Ianira is an impressive, contemporary villa located in the area of Kolymbari near the town of Chania. It is constructed according to the principles of bioclimatic architecture and combines design and functionality offering all modern amenities in a vintage and country feel environment. The villa has 3 en suite bedrooms that can sleep 6 guests, comfortable living areas and a fascinating outdoor space with a well-kept garden, two private swimming pools (one for adults- one for children) and amazing panoramic views of the beautiful landscape. 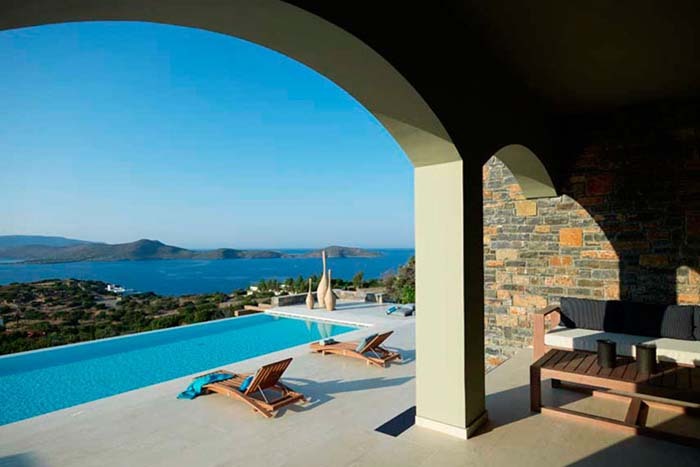 Villa Black Pearl is situated in Eastern Crete, close to the beautiful resort of Elounda. This exclusive villa has a minimalistic desigh and decoration and is built on a hill providing stunning views of the Elounda Bay. It lies on two floors and is equipped to a high standard with all contemporary amenities, offering a comfortable and luxurious setting to its visitors. The villa offers 3 bedrooms that can accommodating 6 guests, fully equipped living areas and a private pool. Vacationing in White Pearl is an experience to carry with you for life and share with your loved ones back home. 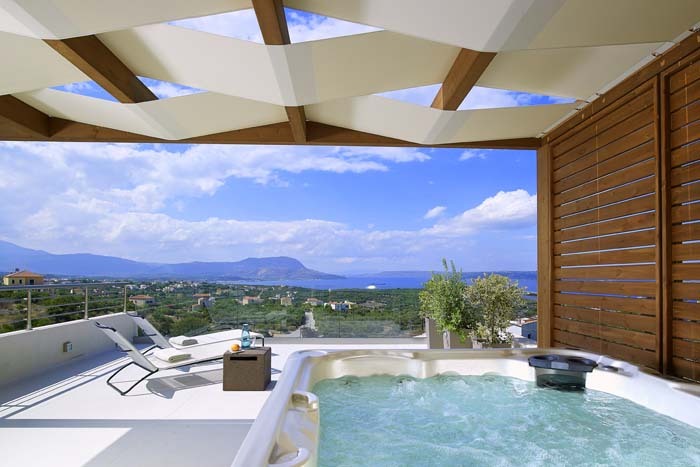 VIP Villa is a 5 star modern villa overlooking the bay of Akrotiri near the picturesque town of Chania. Designed by a sea lover, 3 of the 4 master bedrooms and both living rooms offer breathtaking and panoramic views over the turquoise bay. 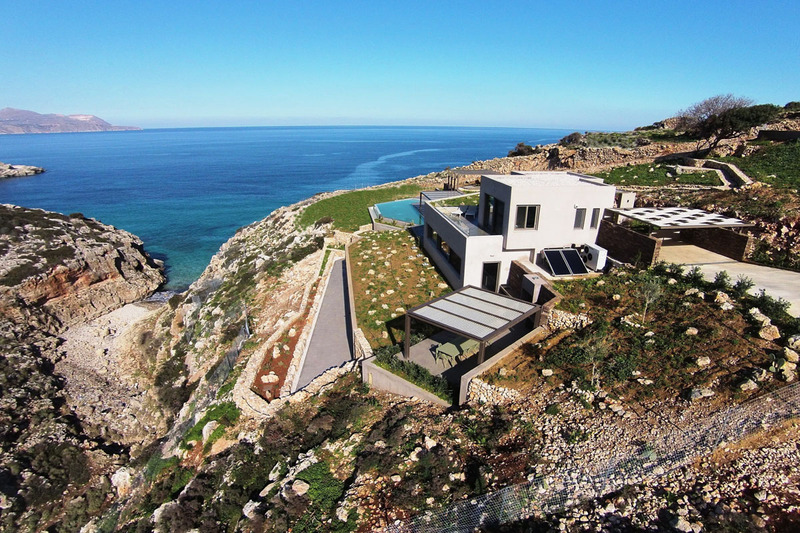 This luxurious villa which accommodates up to 10 guests has been designed with three things in mind: luxury, privacy and enjoying the unique location... as it is one of the very few villas of the area to be in the first row of the sea. From the quality of the construction to the interior design and furniture, no compromise has been made! VIP villa is clearly an ideal retreat for a demanding clientele while it has primarily been designed as the lifetime dream of its owner and not as a rental estate. 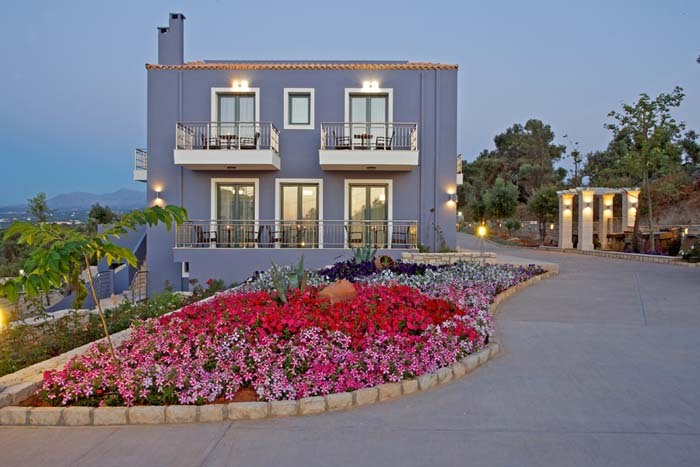 Located in an idyllic location in the area of Agia Marina, Chania are the beautiful Sunny Point Villas. 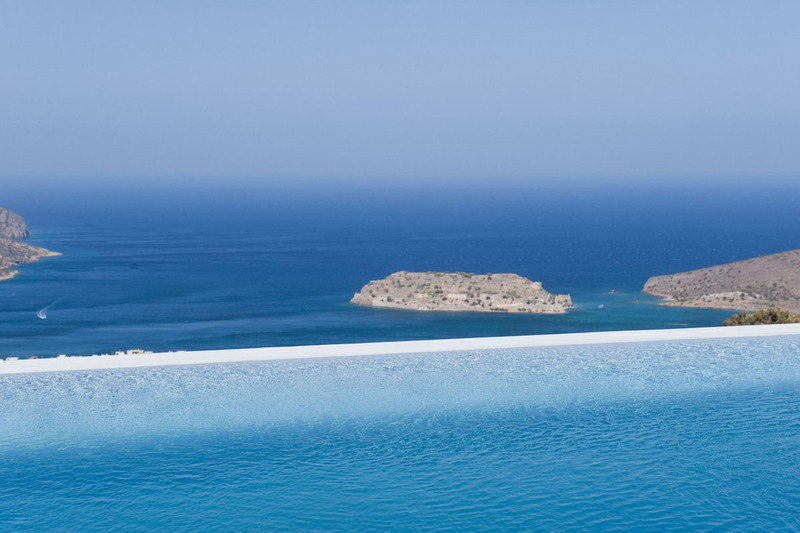 The complex consists of 6 identical, four-bedroom villas offering panoramic views of the turquoise waters of the Aegean Sea and the island of Thodorou. 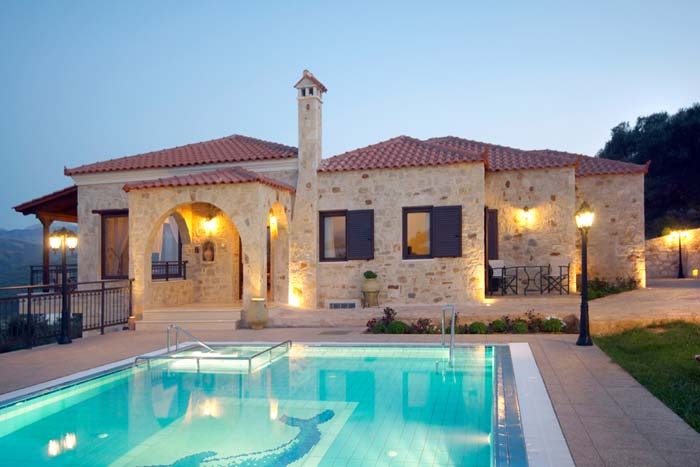 Villas Heaven is a three villa complex situaded in the area of Kissamos, 30km away from the Venetian town of Chania. The complex stands on a quiet and relaxing location surrounded by olive groves and is only a few minutes away from the beach. Each of these cosy three bedroom villas offers a private swimming pool, furnished verandas and lawn garden and is ideal for families, couples or group of friends. Villa Plethora is a brand new villa that belongs in a villa complex, the Euphoria Villas. The villas are situated in a privileged spot in Western Crete, the village of Agios Georgios near the small town of Kissamos. These private villas are designed to provide a luxury holiday to their guests and emphasise on the indoor modern decoration but also on the outdoor relaxing area. 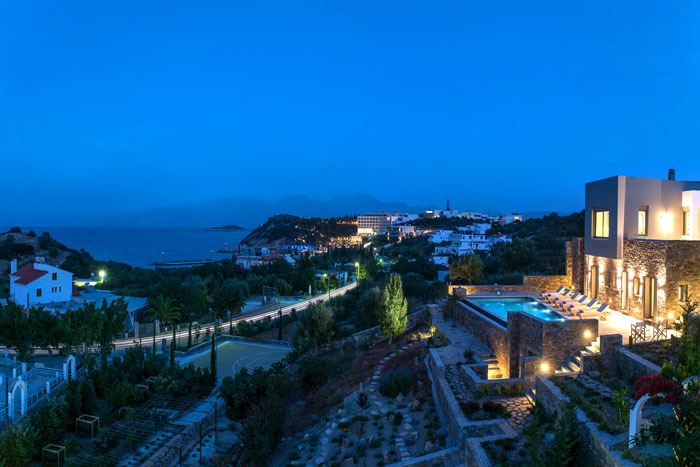 The complex stands on a hillside overlooking the Gramvousa Peninsula and the sparkling turquoise waters of Kissamos Bay. Villa Plethora has two bedrooms, a private pool and terrace while it is fully equipped to serve the needs of its visitors. Villa Imperia is a luxury 3 bedroom villa built on a hillside in the small village of Plaka near the famous resort of Elounda. It belongs in the Elounda Maris Villa Complex and offers superb views of th Spinalonga island, the Elounda Bay and the blue sea that invites you to surrender to daydreaming, far away from the bustling city life. 15% Discount for all bookings for staying 01.05 - 30.06 & 01.09 - 20.09. 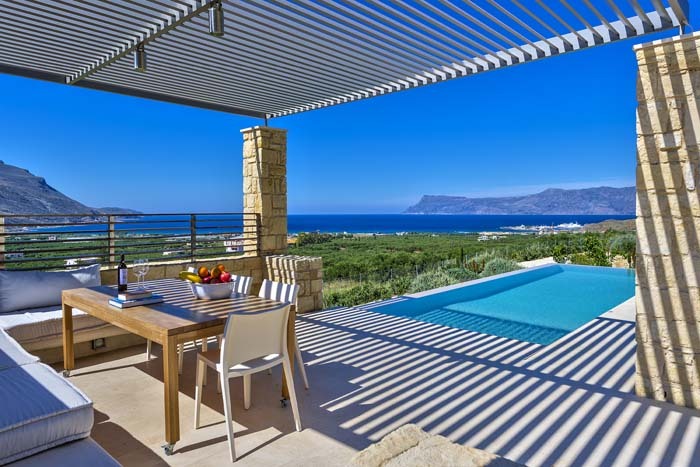 Villa Filira is luxury villa situated a 20min drive from the historic town of Chania and just 5 min away from the coastline and Kolymbari village, in Northwest Crete. The villa has three bedrooms, an comfortable lounge with big French windows bringing the outdoors in, an open plan kitchen, verandas, patios, colour-splashed gardens and a spectacular infinity pool with panoramic views. Villa Filira meets the expectations of even the most demanding customers. It ensures privacy and comfort, beautiful outdoors, stylish interiors and facilities of a truly high standard promising a memorable holiday in Crete. 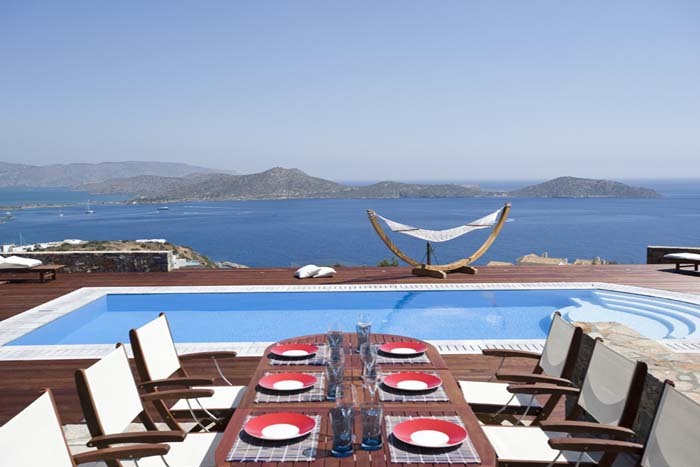 Villa Atlantis is a stunning, luxurious 5 bedroom villa built on a hillside just outside Elounda, overlooking the Elounda Bay and the Venetian island of Spinalonga. The villa lies on three spacious levels and is decorated in a unique and elegant style. 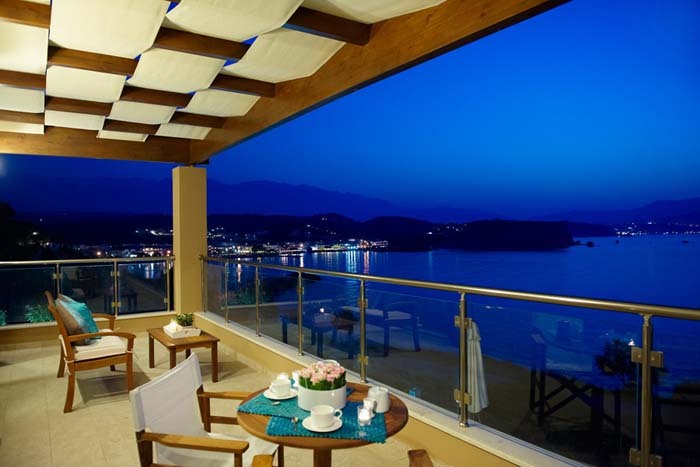 It offers all the facilities anyone can ask to enjoy a deluxe accommodation in the most famous resort in Crete. The calm waters of the sea that lies beneath, the private pool and big lawn garden with palm trees create a magnificent and relaxing scenery that will surely enchant even the most demanding guest. 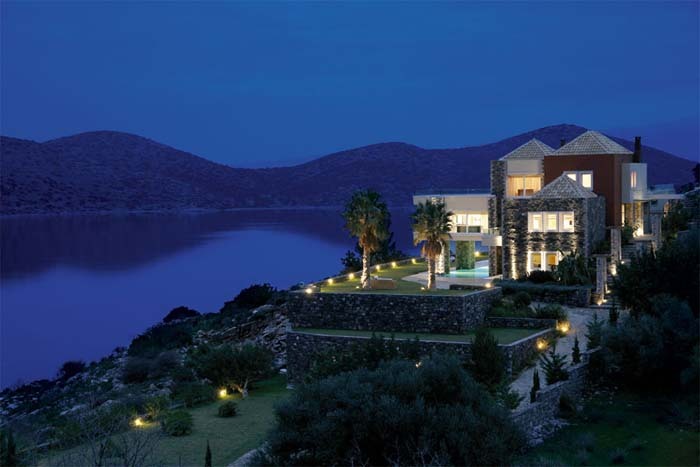 Elounda Luxury villas are two exclusive, new and elegantly designed villas built amphitheatrically on a hill and at close proximity to the picturesque village of Plaka. Villa Topaz (upper level) and Villa Amethyst (lower level) provide an immaculate spot for leisure, rest and unwinding in Crete. Each villa has a 140sqm interior area, 3 spacious bedrooms, private pool with stunning views and a plethora of guest centered amenities. These amazing villas can be rented either individually or as a complex and are a perfect choice for families, couples or group of friends. 10% Discount for all bookings for staying over 10 nights. Villa Iris is a 180sqm private villa, with four bedrooms en suite, a fully equipped kitchen, a spacious living room and dining area and all the modern amenities one can ask for.It located in the area of Polemarchi, west of Chania and has a spacious outdroor area with a private pool, terraces and garden. 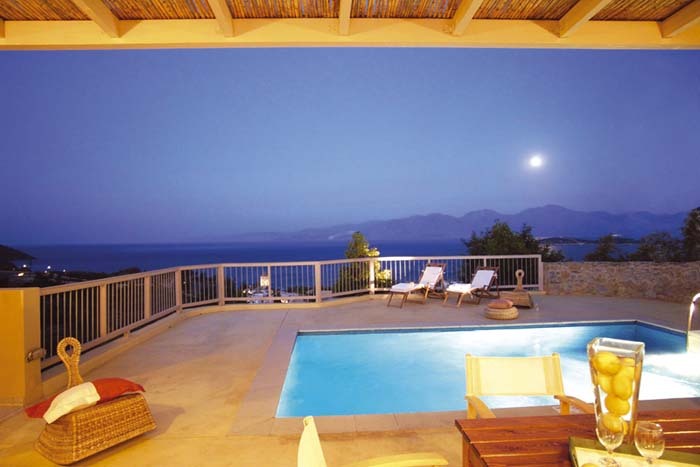 Suggested to those who plan and expect a relaxing holiday in Crete, his property promises to exceed their expectations. 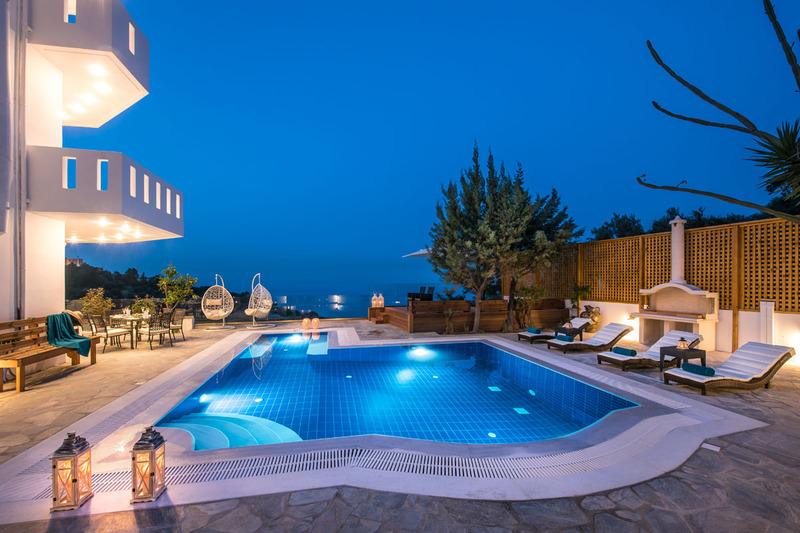 Villa Aqua is a 3 bedroom villa that lies on a hill overlooking the Hersonissos Bay, the sparkling blue waters of the Mediterranean Sea and the cosmopolitan, tourist resort of Hersonissos. 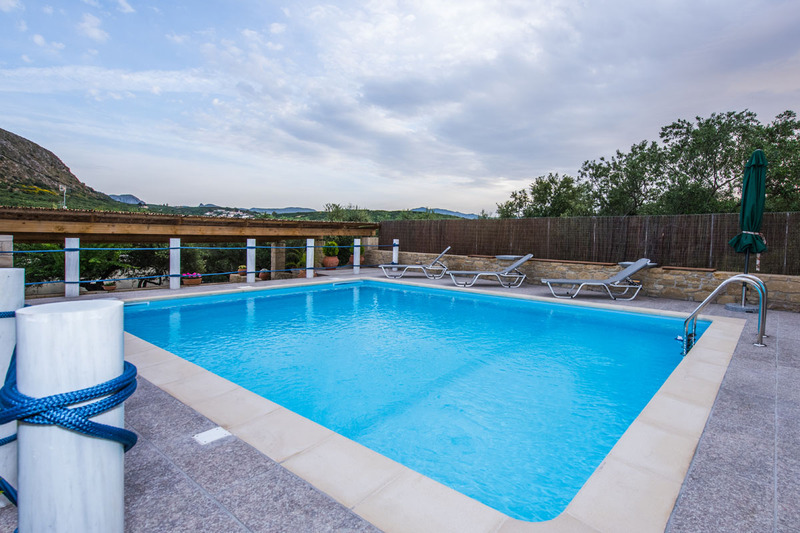 The villa is built in harmony with the landscape, has different levels and features a garden, a big swimming pool with deck chairs, a BBQ area, and an outdoor seating area all with superb views of the surroundings. It can accommodate up to 7 guests and offers all the advantages of contemporary living. It is a perfect choise both for those who appreciate a relaxing holiday but also for those who would like to spend sometime in the nearby resorts and enjoy the famous for its night life. 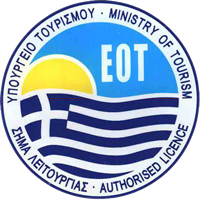 resort of Hersonissos. 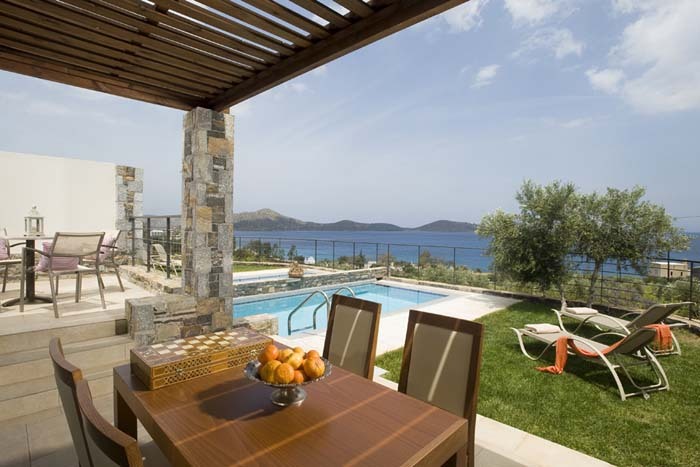 Villa Panorama is a 5 bedroom luxurious villa situated in the area of Elounda. The villa is 250sqm and offers spacious rooms with all the amenities that provide an comfortable stay. The views from the villa (both from inside and outside) are beautiful. Three bedrooms have en suite bathrooms whereas two off them have walk-in-closets that add an extra touch of luxury. The other two bedrooms are in an independent, separate aparment. The villa has a secluded, private swimming pool and shady areas outside that will help you cool down and “escape” from the hot Cretan sun. 10% Discount non refundable rate. Villa Omikron is a newly built, 250sqm private villa, located near the village of Rodia a few kilometers outside the city of Heraklion. 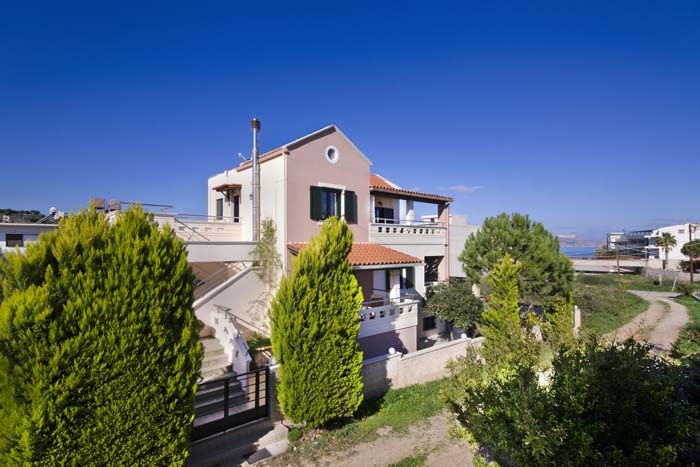 The house stands on a privileged spot overlooking the sea, the islet of Dia and the whole city. It offers three bedrooms in the main house and a separated studio, a private pool and several furnished outdoor areas ideal for relaxing unforgettable moments. Bohemian Blue is a 2 floor, 250 sq.m. 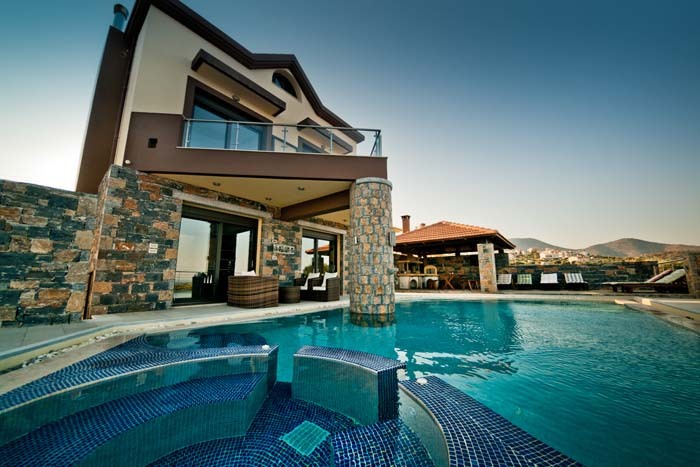 villa, nestled in the picturesque, hilltop town of Koutouloufari. It overlooks the port of Hersonissos, with uninhibited views of its harbor and the Mediteranean Sea. Bohemian blue is more than just an exclusive villa. It is designed to help you relax and recreate in a design oriented atmosphere. 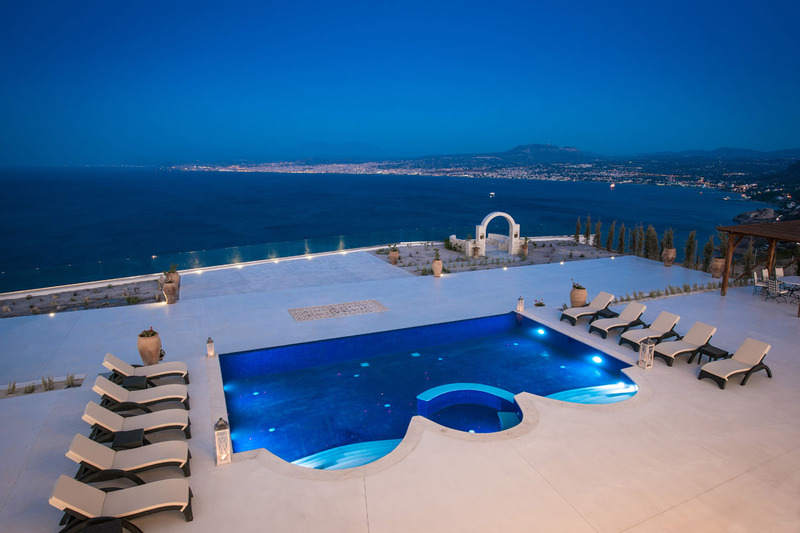 Villa Big Blue is a stunning, 500sqm luxury villa that lies on a hilltop of a peninsula overlooking the sea. It belongs in a hotel resort situated in the area of Lygaria- Heraklion and is only 300m away from the resorts private sandy beach. This stylish property consists of three fully equipped levels and accommodates up to 11 guests in 6 bedrooms. Its modern interiors combined with the spacious well-kept outdoor areas create an ideal environment and promise its guests ultimate privacy, total relaxation and a high standard experience in the beautiful island of Crete. 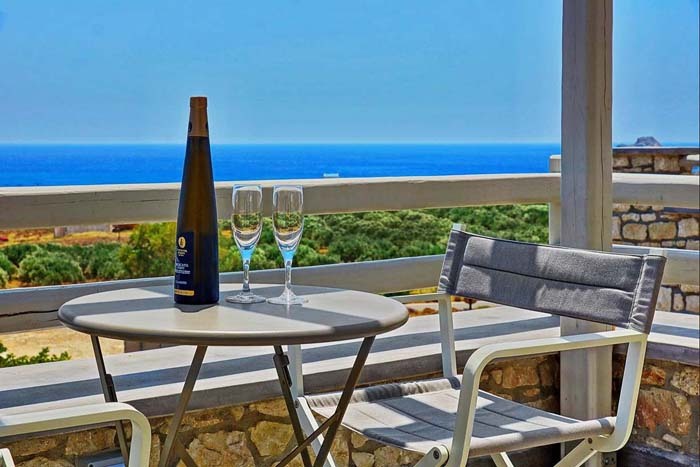 Prina Villas is a complex of two cozy villas located on the outskirts of Prina, a traditional village which is only a 20 minute drive away from the cosmopolitan town of Agios Nikolaos. Each villa is 120sqm and have two bedrooms, a private swimming pool and garden while they are fully equipped to guarantee a comfortable stay. The fresh air, the views of the rocky mountains but mostly the calmness and pure beauty of the nature and the surroundings ensure that your holiday in Crete will be unforgettable. 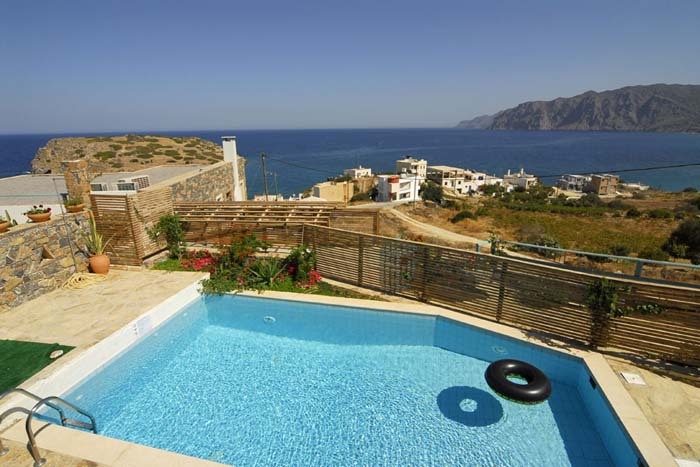 Villa Festos is a beautiful 4 bedroom villa located in South Crete near the town of Ierapetra. It has a spacious 180sqm interior area and a 500sqm garden with furnished terraces and private pool. Built only a few meters away from the sea in a peaceful and tranquil location this villa is a perfect choice for those seeking for a relaxing and luxurios retreat in Crete. Elounda Gulf Villas and Suites is a luxury boutique Villa Hotel consisting of 18 stylish and modern villas and 10 unique suites. 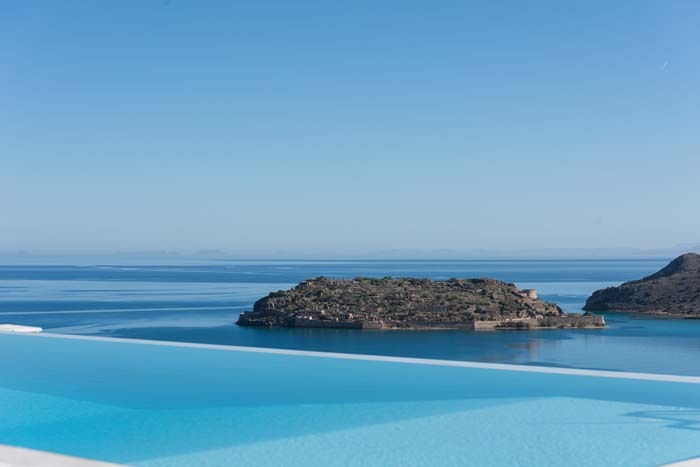 It is situated on the hillside overlooking the Gulf of Mirabello on the outskirts of Elounda village.This secluded stars hotel is a member of the Small Luxury Hotels of the World and winner of Greece`s Leading Villa Award. The Elounda Gulf Villas & Suites 5 stars hotel promises its guests sweeping views of the dazzling Mediterranean Sea and offers high end personalized services.The hotel`s elite clientele can indulge in luxury and unparalleled comfort as they experience a unique holiday of tranquility and relaxation in one of these exclusive luxury villas in Greece. 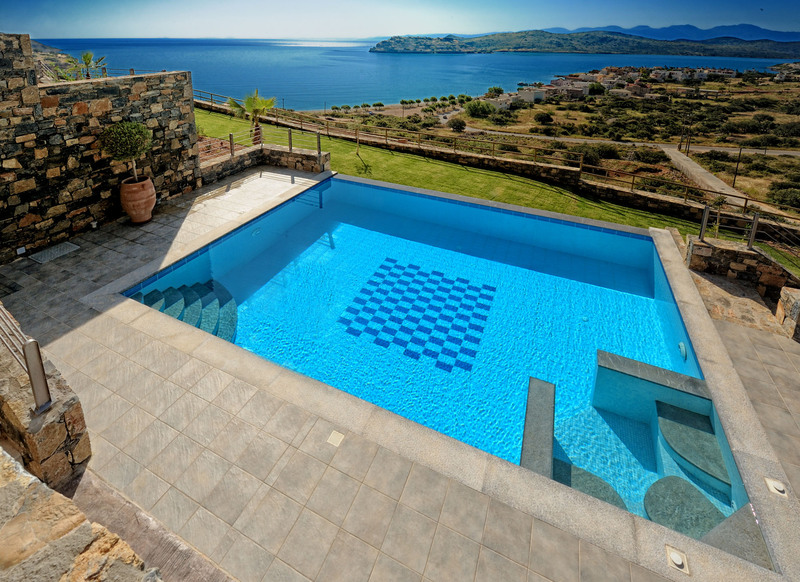 Villa Aori is a brand new villa situated in the area of Apokoronas- Chania. It belongs in a villa complex and consists of three levels. 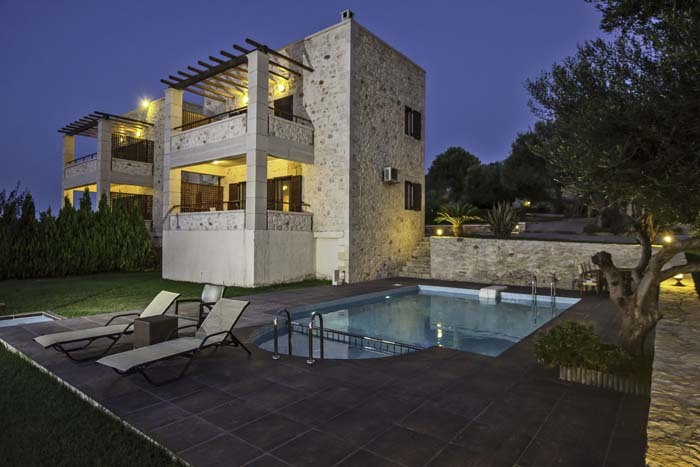 The villa has 4 bedrooms all en suite with luxurious bathrooms and with their own terrace, a private pool / children’s pool and an outdoor Jacuzzi tub on the top floor of the villa. Villa Aori offers panoramic views ranging from the blue strip of Souda Bay, the scattered Apokoronas villages to the magnificent White Mountains. 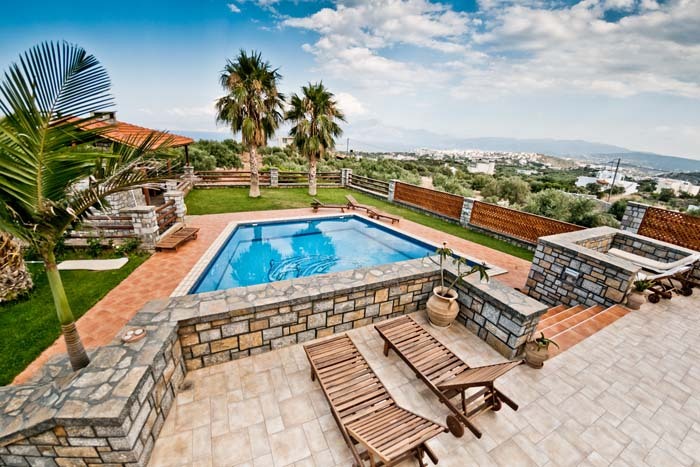 Villa Irida is a 3 bedroom cozy villa located in the beautiful area of Tersanas- Chania. The villa is divided on two floors with the ground level having a huge bedroom with a separate entrance offering its visitors privacy and autonomy. The villa’s light and relaxing colors in furniture and textiles, in combination with the facilities that all guests seek for, like the satellite TV in every room and the free satellite WiFi, are the key elements of a relaxing and enjoyable holiday in one of the most beautiful areas in Crete. 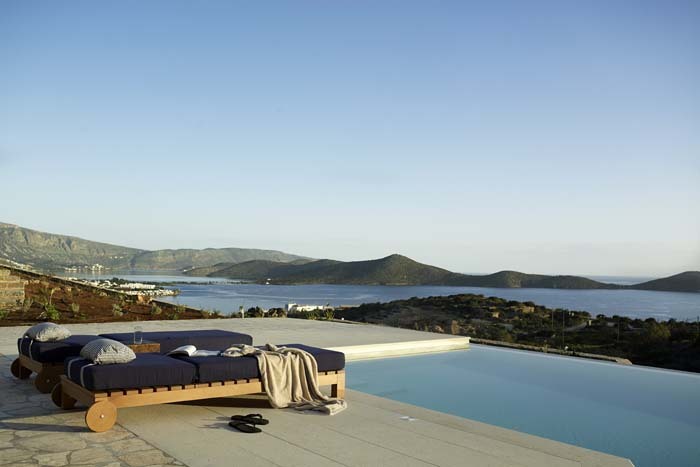 Queen Villa is a brand new residence built on a hillside in the area of Elounda. The villa offers six bedrooms within the house and two guest rooms with an independent access, all en suite. 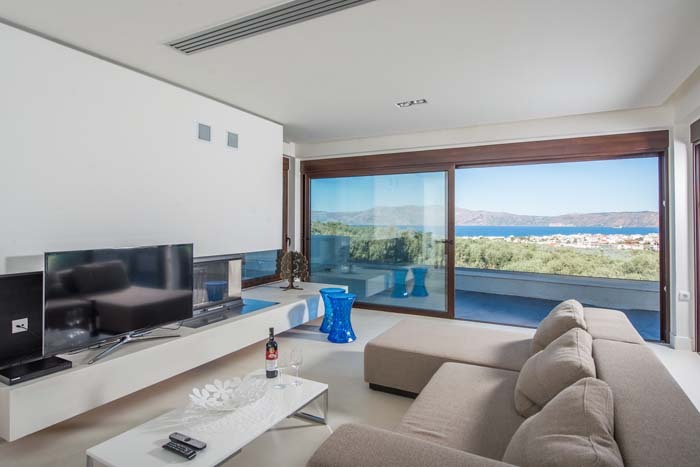 This luxurious contemporary residence offers panoramic views of stunning sunrises and sunsets, the crystal blue waters of the Elounda Bay and the magical Cretan landscape. The modern architecture, combine with the sophisticated furnishings and beauty of the surroundings to make this villa unique. Sea View Villas are two private villas located in Agia Pelagia just 1km from the sandy beach with amazing sea views of Agia Pelagia Bay. Each of the villas has a private pool with three bedrooms all ensuite. Villa Castro is a luxury 3 bedroom villa built on a hillside in the small village of Plaka near the famous resort of Elounda. It belongs in the Elounda Maris Villa Complex and offers superb views of th Spinalonga island, the Elounda Bay and the blue sea that invites you to surrender to daydreaming, far away from the bustling city life. If you are looking for accommodation in a peaceful, quiet environment and need to relax from the city stress, Villas Triopetra in Southern Crete is the ideal choice for you. Located on a hillside just 2km away from an amazing sandy beach are these two private villas.Each villa has its own private terraces, garden and pool and consist of two bedrooms, a bathroom, a WC and fully equipped interior areas that promise an unforgettable getaway for its guests. Villa Serenity is a beautiful villa built in the traditional and peaceful village of Prines near Rethymnon. It lies on three levels and has five ensuite bedrooms, a fully fitted kitchen, a living area with a fireplace and a gym room for those who want to stay fit on their holiday. Amongst the big garden there is a private swimming pool, furnished terraces and a BBQ area. The property has views to the sea and beautiful surroundings and is an ideal villa for visitors looking for a relaxing holiday in Crete! 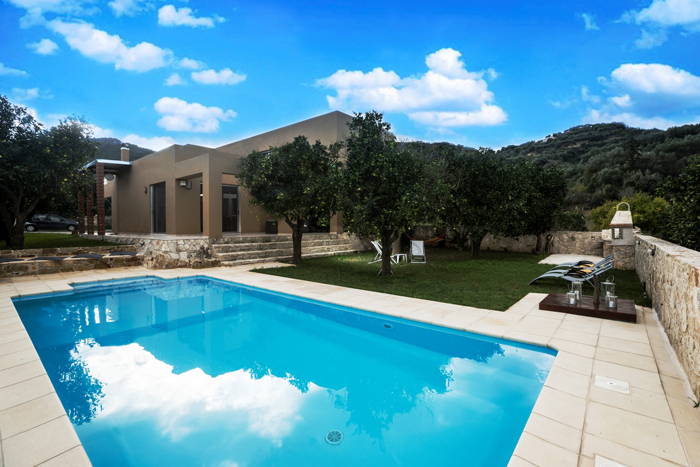 Villa Elia is a 5 bedroom, modern and luxury villa located in the area of Kissamos near the beautiful town of Chania. The villa consists of two separate apartments that are rented together for groups of up to 10 guests. It features spacious and minimally decorated indoor and outdoor areas, a private pool and stunning views of the sea. Villa Elia is a perfect choice for visitors looking for a blend of freedom and flexibility in a well-equipped and beautifully designed home away from home. Villa Lato is a a 3 bedroom private villa located in the area of Agios Nikolaos only a few meters from the long and sandy beach of Almyros. This shining jewel of the prestigious Villa’ family, the three-bedroom Villa (indoor 150 m2), greed each guest with beautiful views from either stepping out into the terrace or looking out of their windows and balconies. 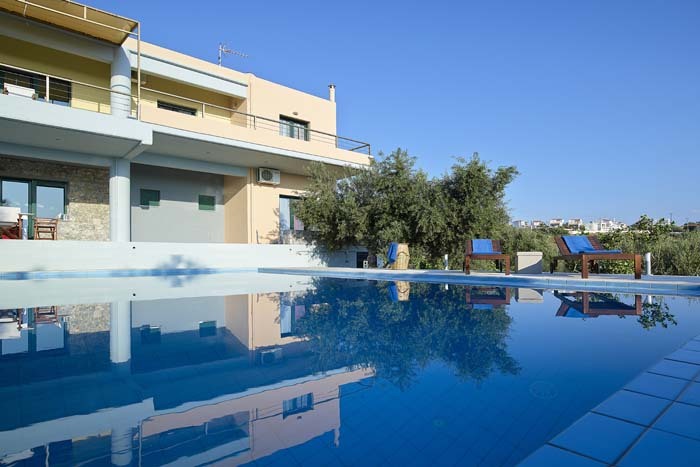 Villa Bluebell is a 3 bedroom cozy villa located in the beautiful area of Tersanas- Chania. The villa is divided on two floors with the ground level having a huge bedroom with a separate entrance offering its visitors privacy and autonomy. Located in the area of Elounda and only 5km from the town of Agios Nikolaos are the Elounda Vista Villas, a complex of 8 cozy and beautifully decorated houses. The block consists of seven 1 bedroom villas and a larger one with 2 bedrooms that share a 120sqm swimming pool. 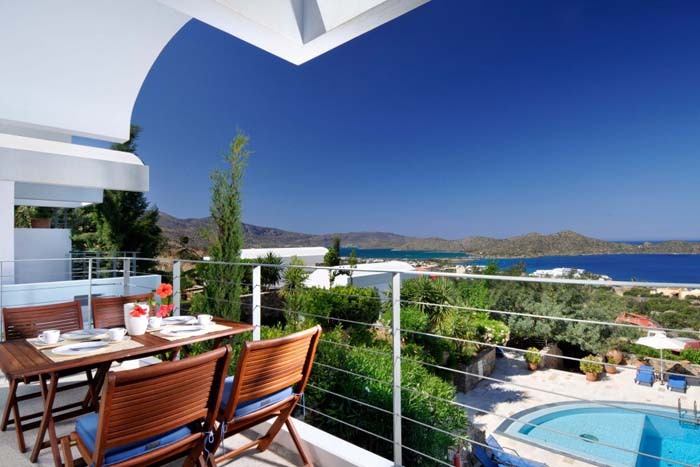 The villas are built on a hillside and offer stunning views of the Elounda Gulf and relaxing landscape. 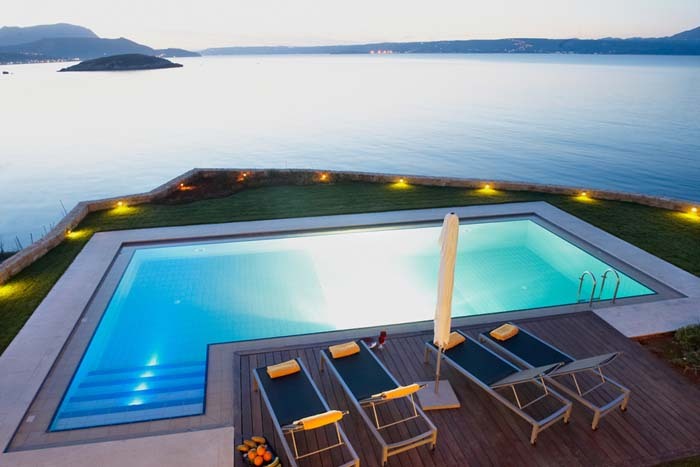 A modern, private villa situated on a dreamlike spot in the area of Akrotiri in Chania, overlooking the bay of Kalathas. Villa Lene is built on 4.500sqm plot, has a spacious 300sqm interior area offering six bedrooms and living areas decorated in a unique, modern style.The guests can enjoy the huge private pool of 125sqm which offers delightful views of the Bay of Kalathas and pamper themselves with a relaxing, luxurious holiday. Villa Charisma is a brand new villa that belongs in a villa complex, the Euphoria Villas. The villas are situated in a priviledged spot in Western Crete, the village of Agios Georgios near the small town of Kissamos. These private villas are designed to provide a luxury holiday to their guests and emphasise on the indoor modern decoration but also on the outdoor relaxing area. The complex stands on a hillside overlooking the Gramvousa Peninsula and the sparkling turquoise waters of Kissamos Bay. Villa Charisma has two bedrooms, a private pool and terrace while it is fully equipped to serve the needs of its visitors. 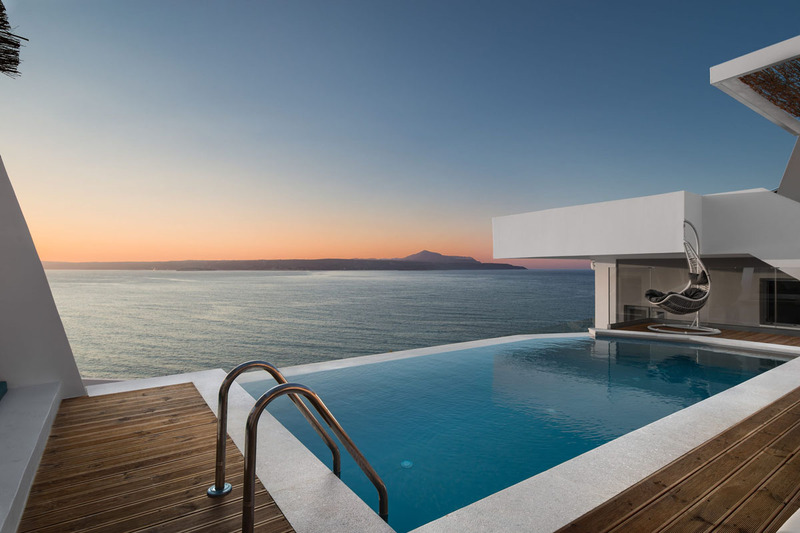 Villa Akrotiri is an luxurious, modern villa that stands on a cliff right next to the sea in the area of Akrotiri-Chania. It offers four bedrooms en suite,a cosy living/ dining room, a kitchen with all the appliances, a cinema room and a gym all decorated in a minimalistic style creating a relaxing environment. Villa Aeriko is a 200m stone built villa, located in the Akrotiri Peninsula, in the prefecture of Chania. The residence stands in a 3.700sqm plot of land and overlooks the Souda bay offering mesmerizing views of the sea and mountains. This spacious villa has 4 bedrooms that accommodate 9 guests, stylish and well equipped interior areas and is an ideal choice for a relaxing holiday as it is close to sandy beaches and a few kilometers away from the town of Chania with its lovely Old Venetina Harbor and Old City. Villa Abyss is a brand new villa that belongs in a villa complex, the Euphoria Villas. 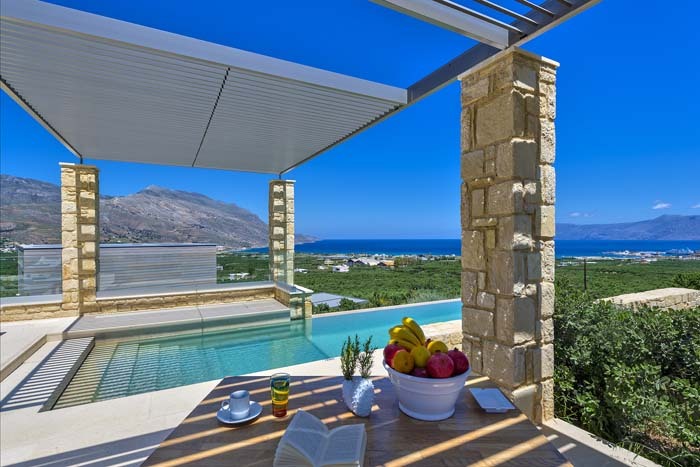 The villas are situated in a priviledged spot in Western Crete, the village of Agios Georgios near the small town of Kissamos.These private villas are designed to provide a luxury holiday to their guests and emphasise on the indoor modern decoration but also on the outdoor relaxing area. The complex stands on a hillside overlooking the Gramvousa Peninsula and the sparkling turquoise waters of Kissamos Bay. 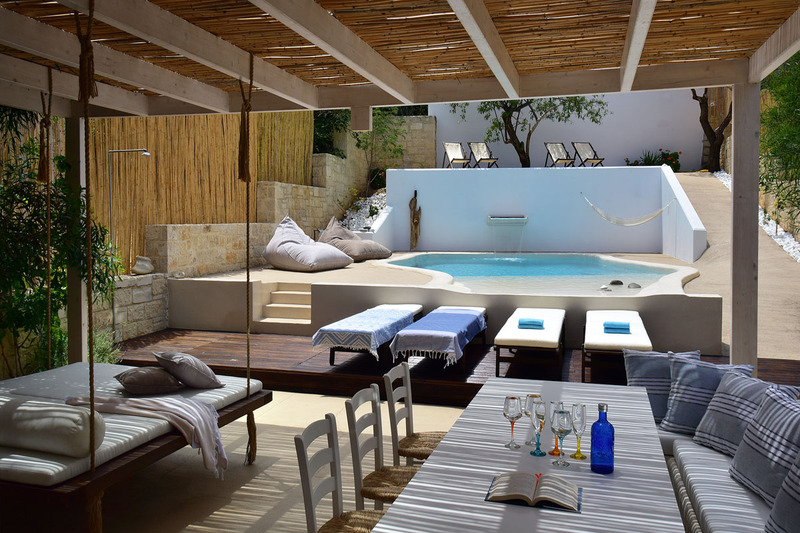 Villa Abyss has one bedroom, a private pool and terrace while it is fully equipped to serve the needs of its visitors. 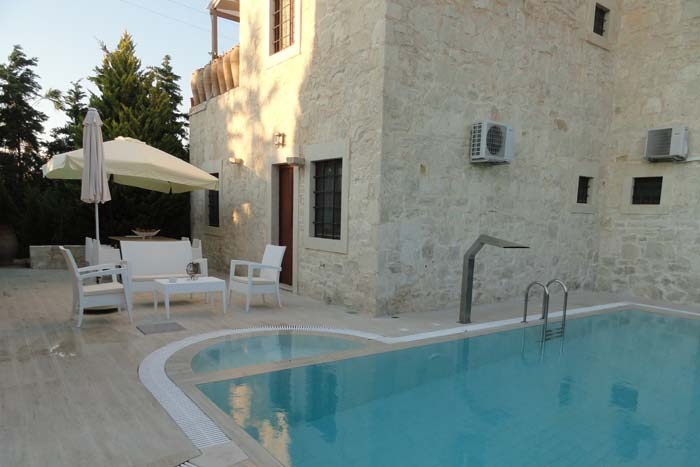 Villa Sunshine is situated 200m from the center of the traditional village Prines near the town of Rethymno. 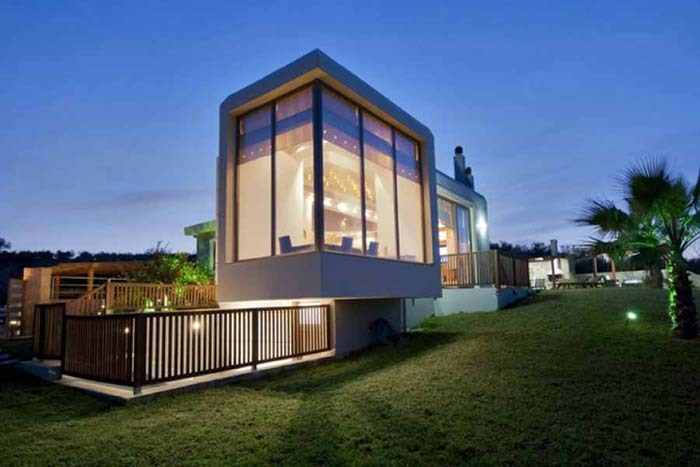 It is built on a 2.200sqm plot of land, surrounded by trees ensuring privacy and relaxation. 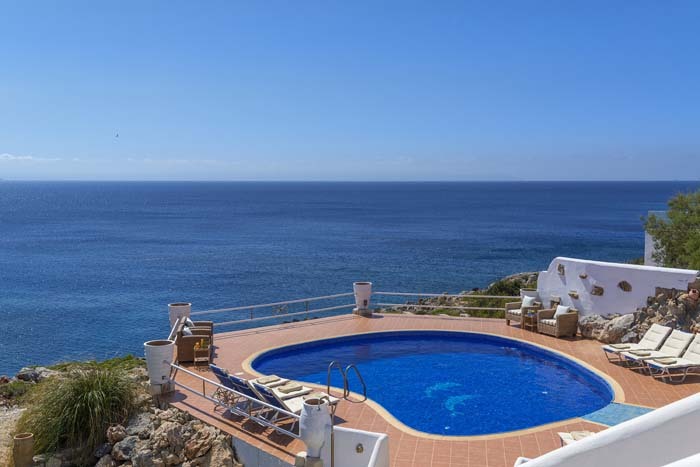 The villa has a private pool, large terraces and verandas all with amazing views of the surrounding area. It is designed to accommodate eight guests in four en suite bedrooms and is decorated in a way that combines traditional and modern elements. 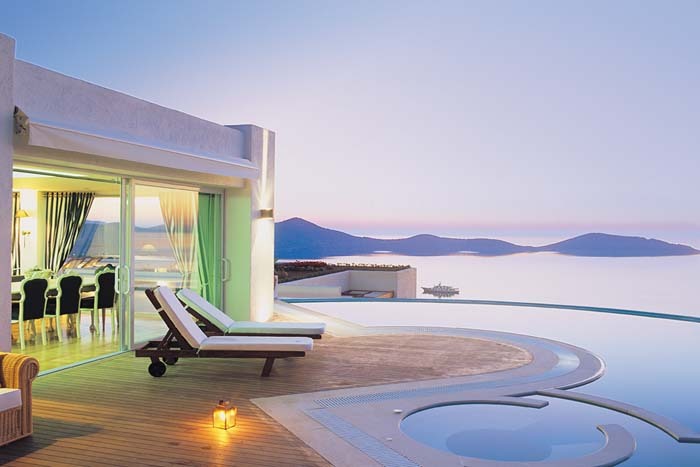 Domes of Elounda is a complex of eight luxurious and individually designed villas, all with private swimming pools. 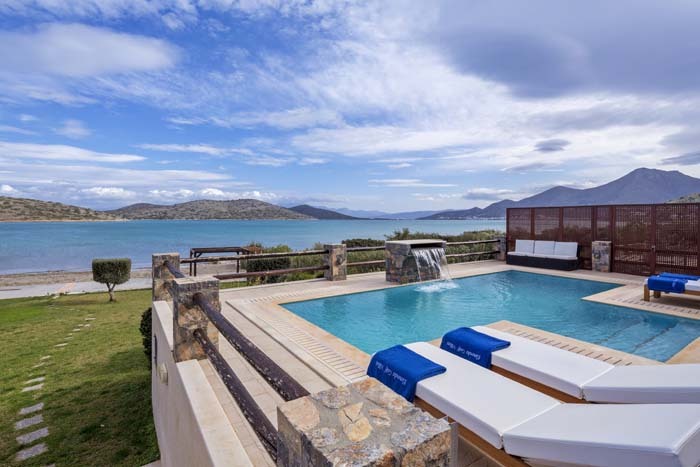 The villas overlook the Elounda bay and are designed for those who want to combine the benefits of a five star resort with the ultimate privacy of a private villa. 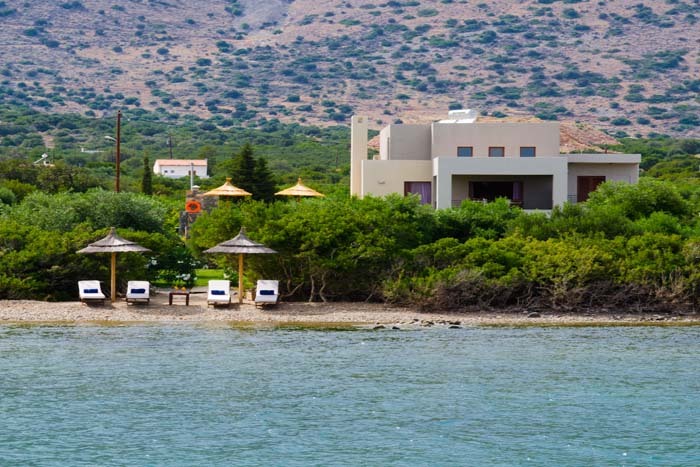 Located over a vast area of 16.000, each villa is designed in style and offers beautiful views over the Elounda Gulf. Upscale “Domes” services harmonically combined with peaceful atmosphere, create the epitome of luxury vacation. 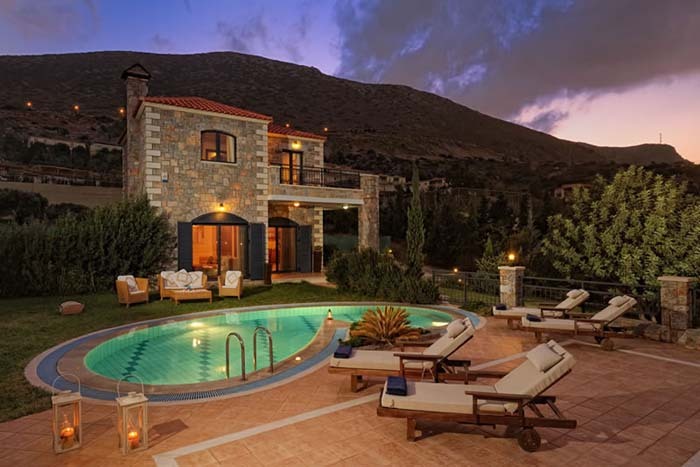 Villa Jasmine is six bedroom, beautiful villa situated in the area of Kalamaki only 5 km away from the picturesque town of Chania and 500m away from the beach. The villa has a 420sqm interior area and lies on three floors. It is surrounded by a huge lawn garden and high trees providing privacy and crating a unique environment. The villa features two, separate pools, one for adults and one for children while provides all the modern facilities to ensure a comfortable and relaxing holiday to its guests. 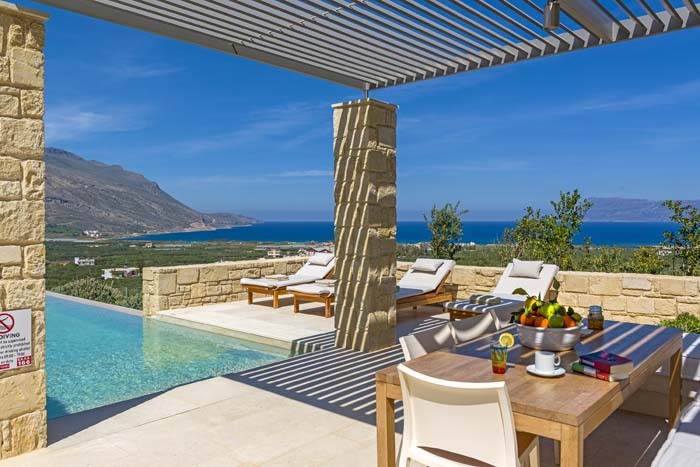 Xerokampos Villas is a newly built 3 villa complex located in south Crete, near the peaceful seaside village of Xerokampos, with its amazing, crystal clear water beaches. Each villa has 2 bedrooms, 2 bathrooms, a private pool and can accommodate up to 4 or 5 guests. These cosy and stylish villas are the ideal destination for visitors that are looking for an ultimate experience of relaxation combined with a unique hospitality. 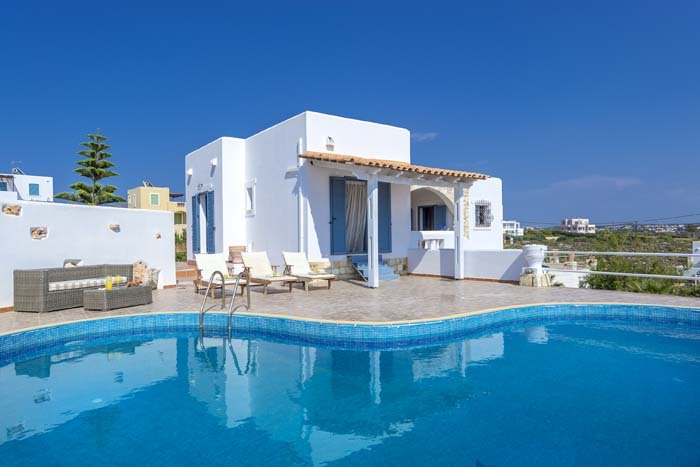 Villa Pelagos is a 2 bedroom cozy villa, located in the area of Ierapetra in Southern Crete. The villa is built right on the beach making it a perfect choice for guests that want to enjoy a relaxing holiday, for families with children and for couples that are looking for a romantic getaway. It features a wide range of facilities that ensure a luxurious and comfortable accommodation, a private swimming pool, BBQ area and lovely garden. 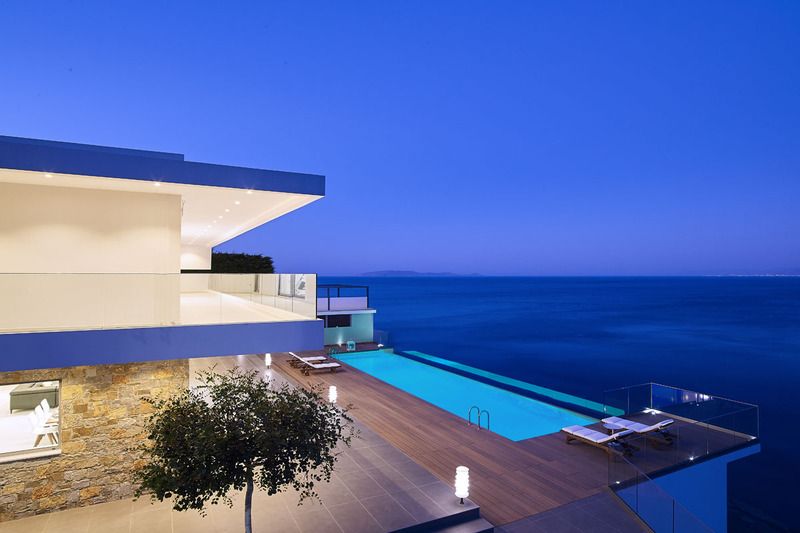 Villa Hermione is a newly built (in 2016), modern and unique villa located in the area of Agios Nikolaos. The house stands on a small hillside overlooking the Mirabello bay and is only 200m away from the “blue flag” awarded beach of Havania. 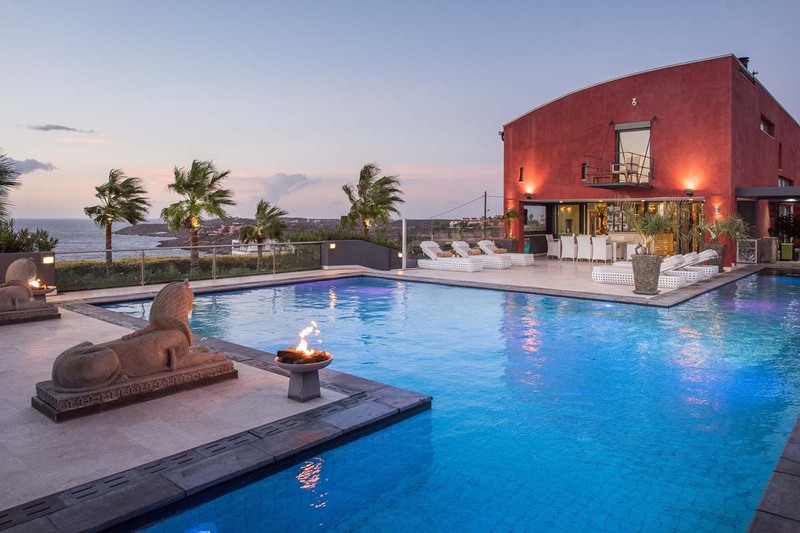 This contemporary, luxury villa offers three bedrooms, all modern amenities, a private infinity pool with a hydro massage, furnished outdoor areas, a small basketball court, a Finish sauna and gardens. 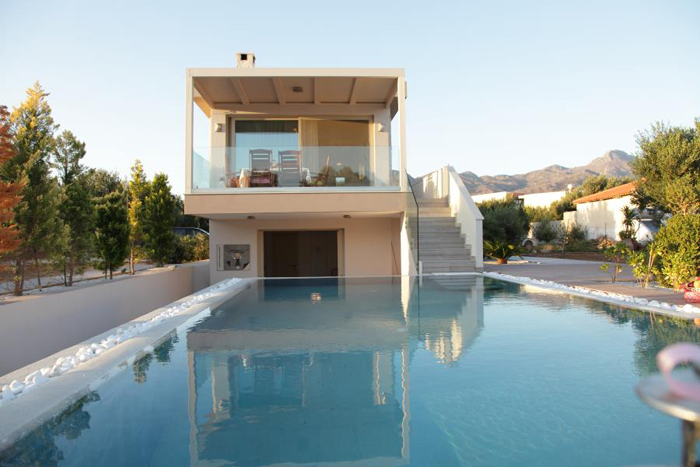 A beautiful villa that guarantees that even the most demanding guest with spend an unforgettable holiday in Crete. Special price 450,00 euro per night for June.